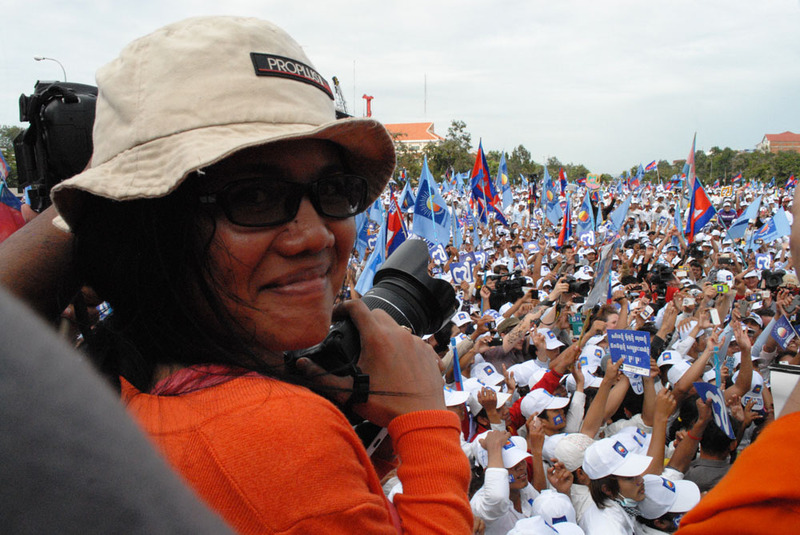 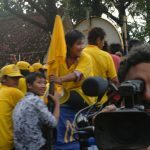 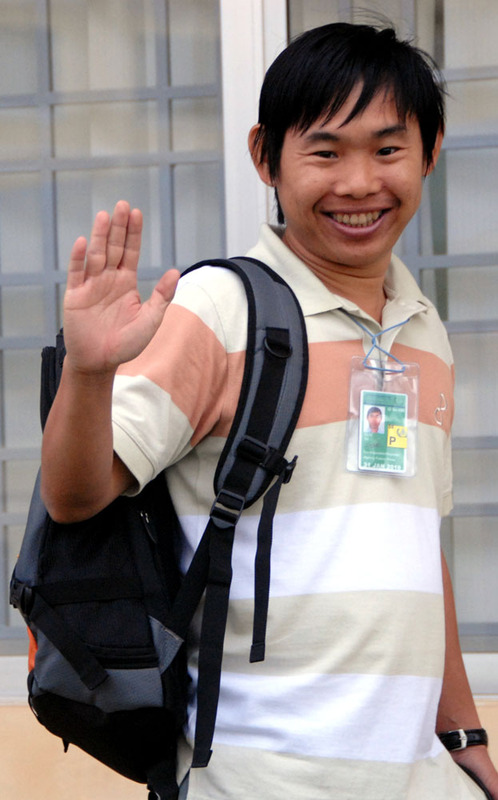 Journalist Manny Muang in Phnom Penh during campaigning for the 2013 elections. 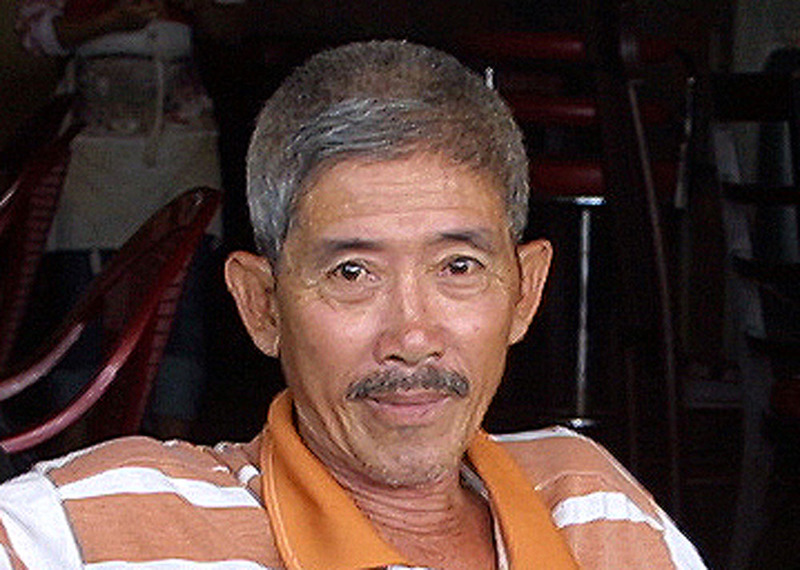 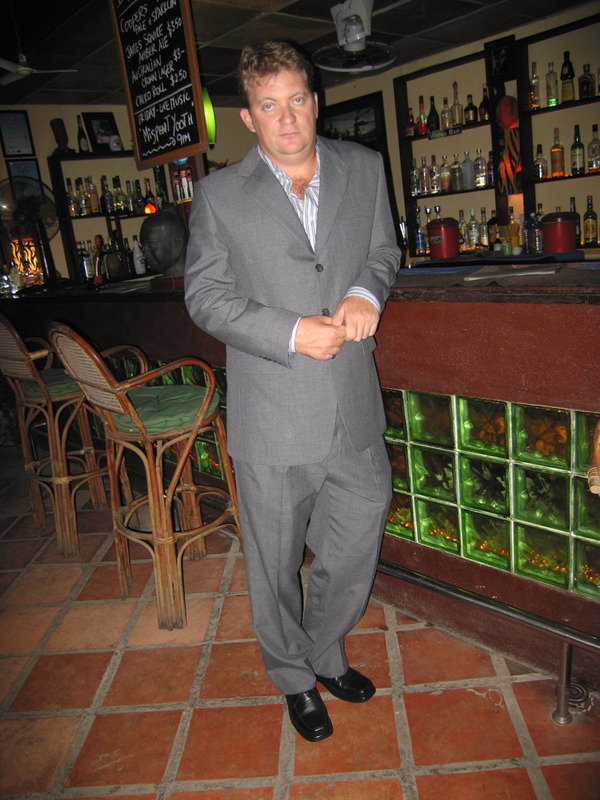 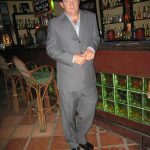 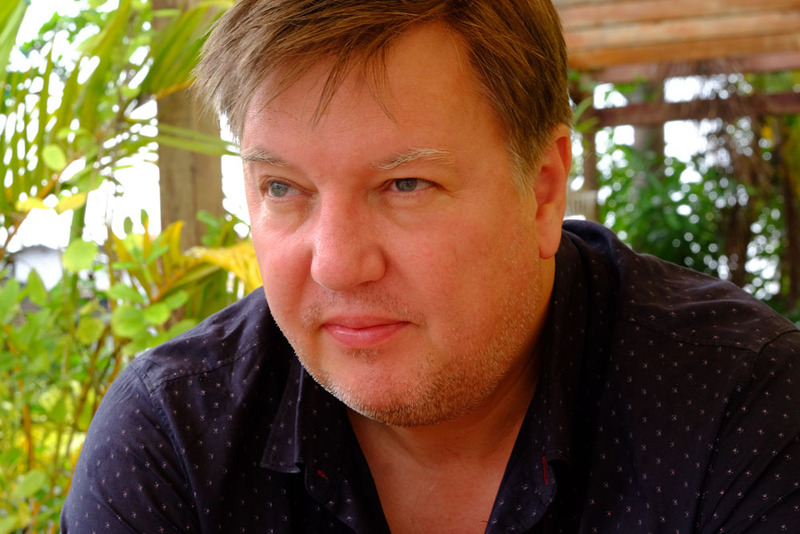 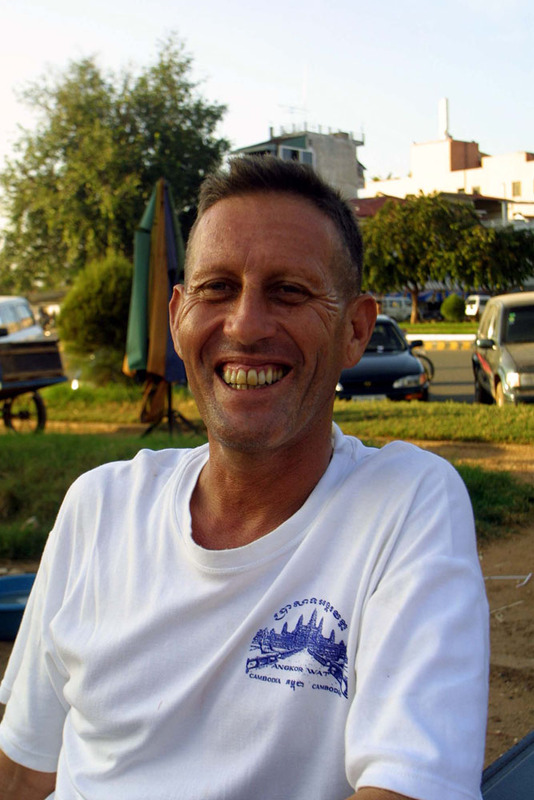 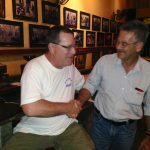 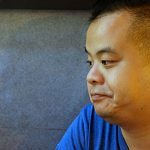 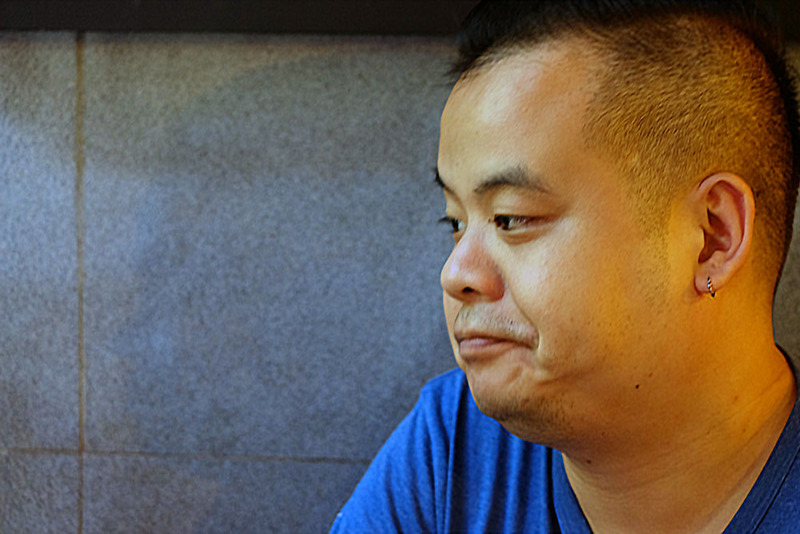 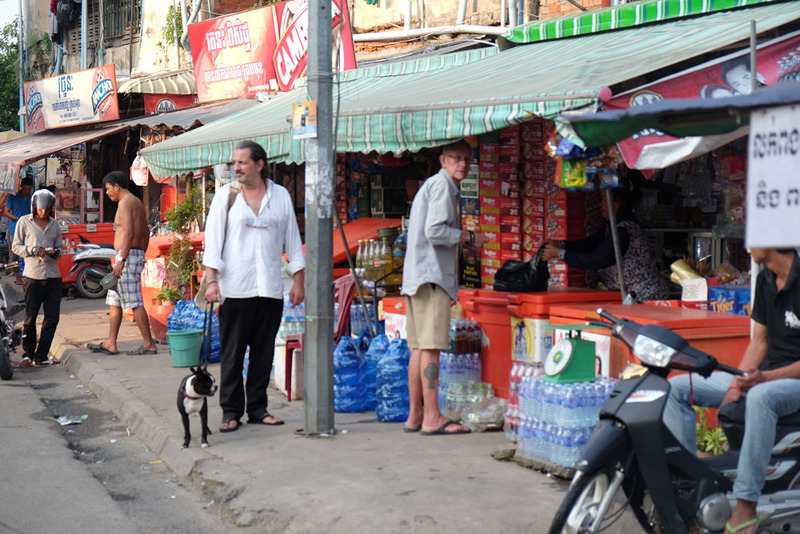 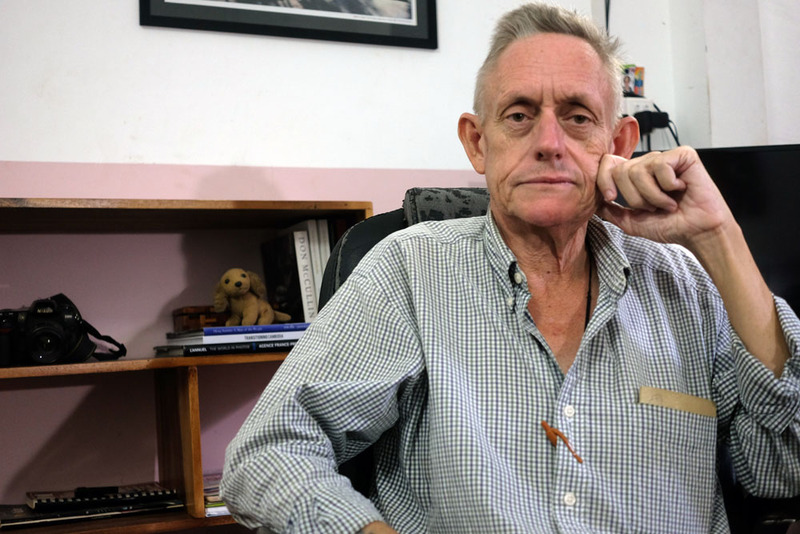 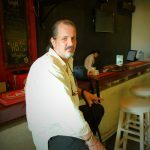 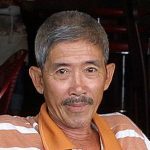 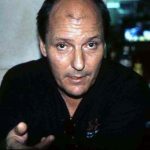 Journalist, restaurateur and own of Cambodia’s famed Cantina Hurley Scroggins. 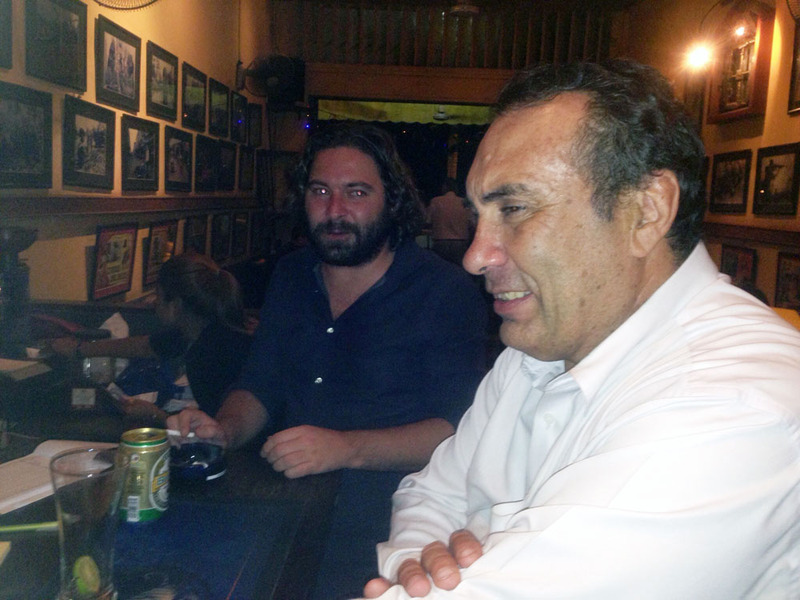 Former editor of the Phnom Penh Post, Seth Meixner with Rick Valenzuela. 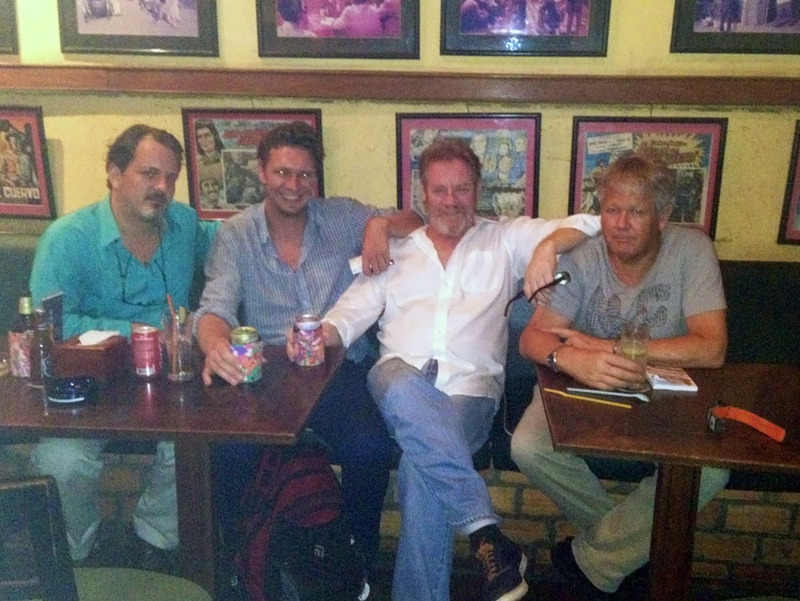 Journalists Rupert Winchester, Daniel de Carteret, Luke Hunt and Craig Skehan at Cantina around 2013. 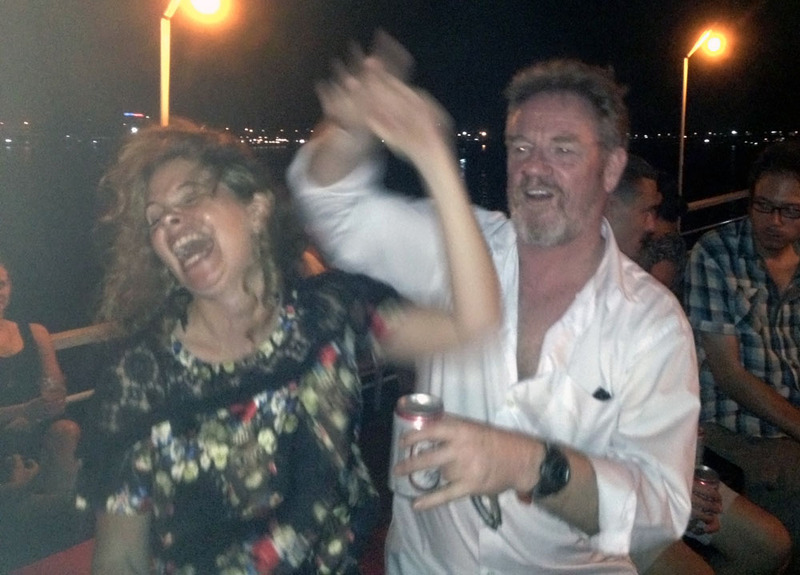 Luke Hunt dances with Kate Bartlett aboard an OPCC booze cruise in 2013. 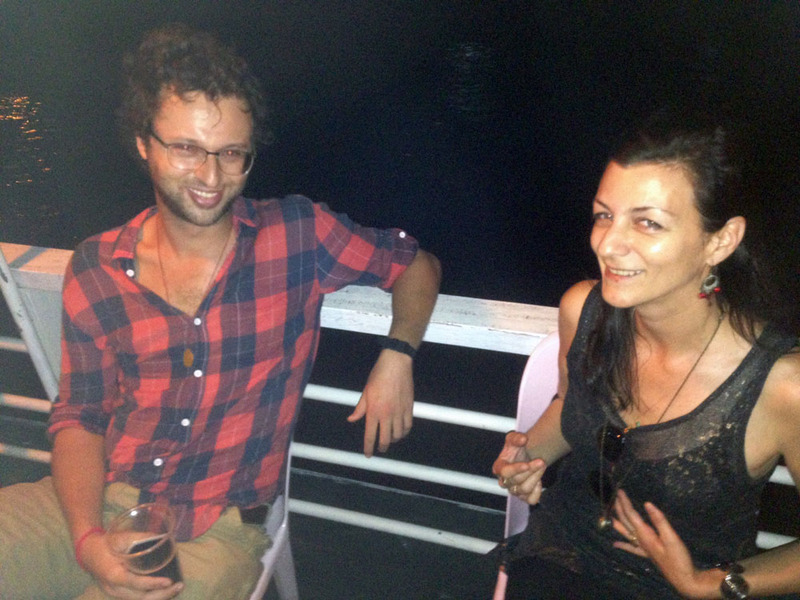 Journalists Daniel Ottis and photographer Anne Holmes aboard an OPCC booze cruise. 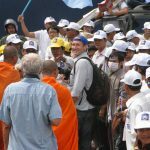 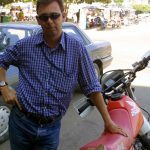 Journalist Ben Woods from the Cambodia Daily. 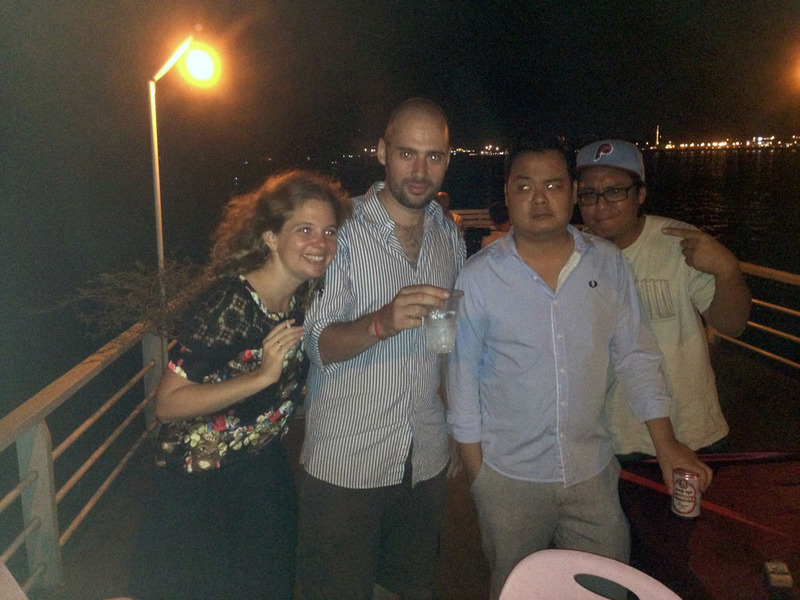 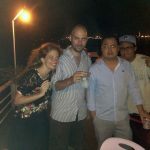 Journalists Kate Bartlett, Sebastian Strangio, Irwin Loy and Rick Valenzuela aboard an OPCC booze cruise. 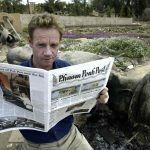 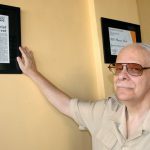 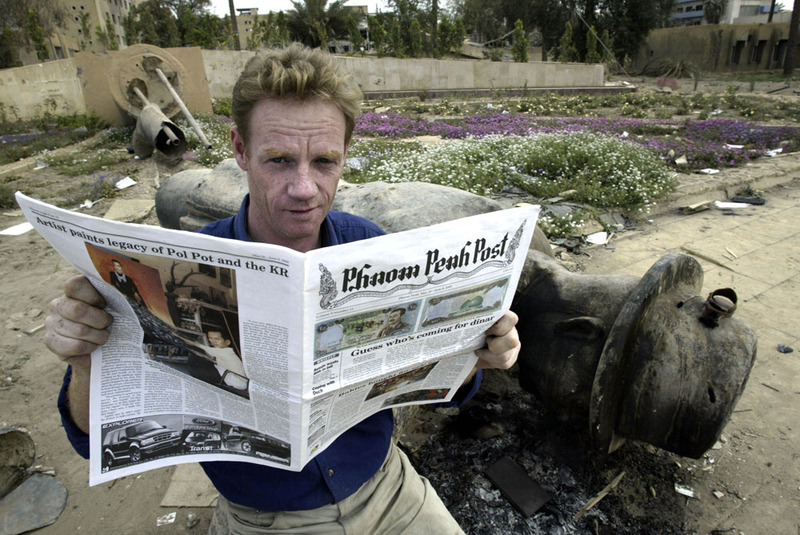 Luke Hunt in Baghdad following the 2003 US invasion of Iraq reads a copy of the Phnom Penh Post. 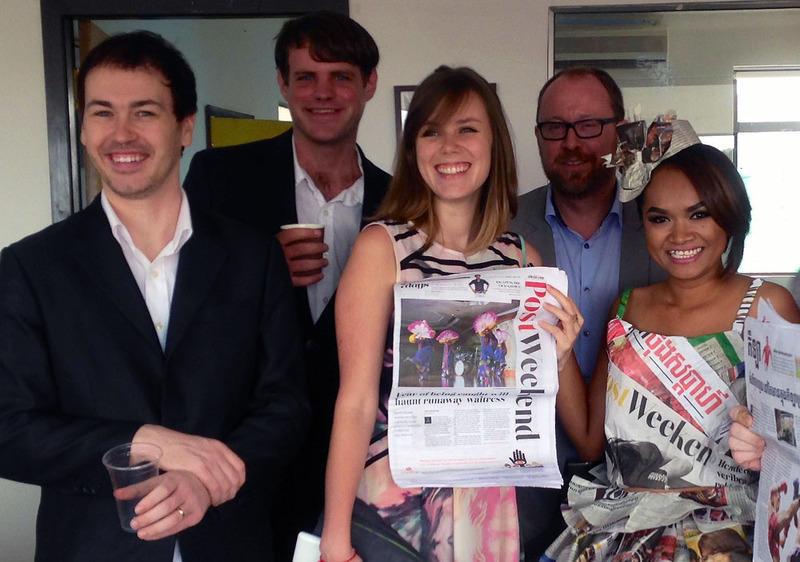 Australian journalists Lindsay Murdoch and Craig Skehan at Meta House, 2016. 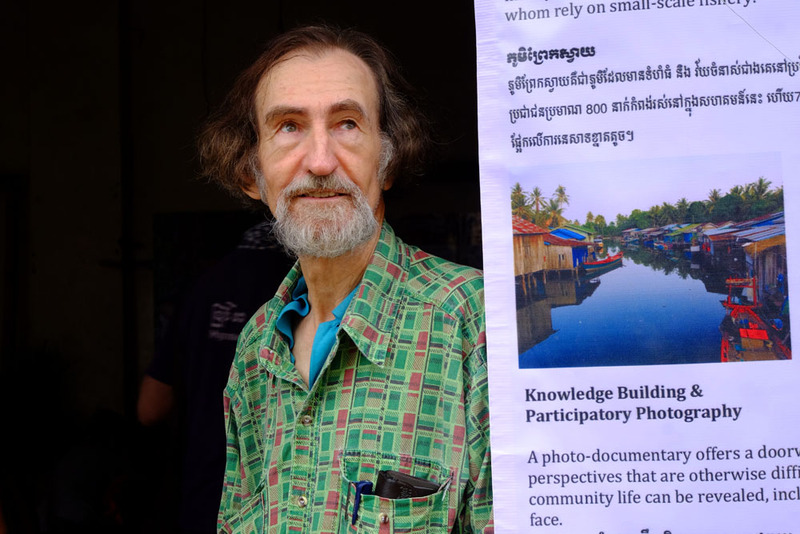 Photographer Anders Jiras at the opening of an exhibition about Cambodia’s Muslim Cham at meta House. 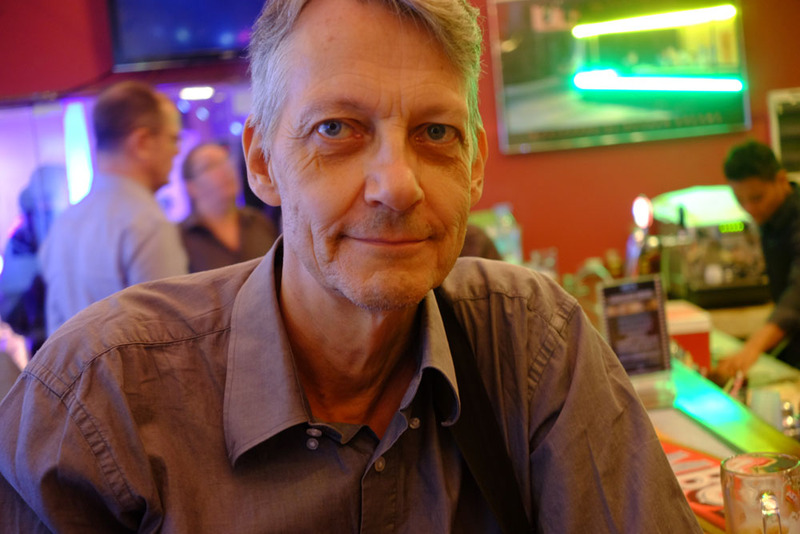 Film maker Tom Fawthrop at the 2016 Kem pot Reader’s and Writer’s Festival. 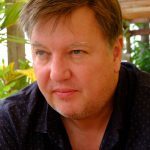 Trade unionist and OPCC member Wim Conklin. 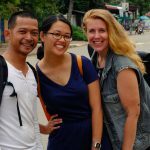 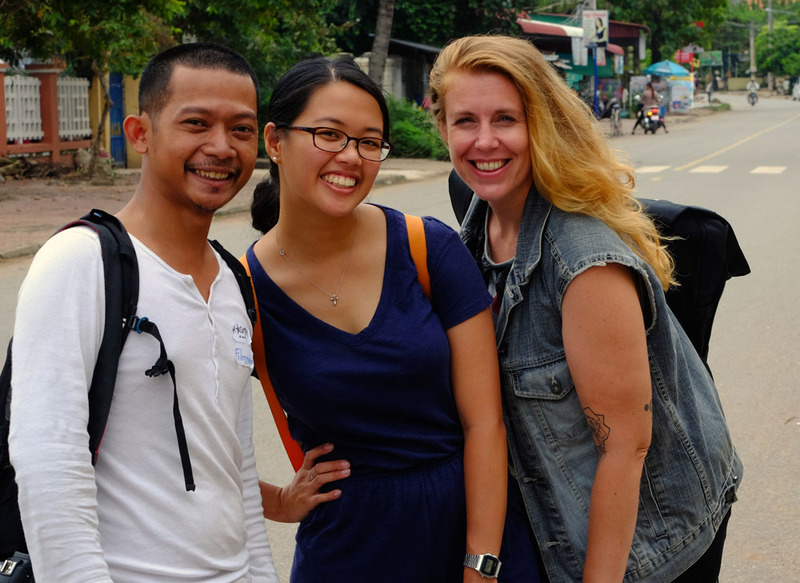 At the 2016 Kampot Readers & Writers Festival Janrasmey Alezovann, Corinne Tan, Janneke Highstreets. 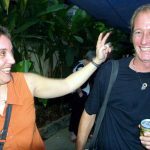 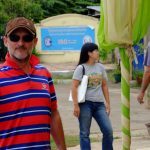 At the 2016 Kampot Readers & Writers Festival, David Potter and Bee Ley. 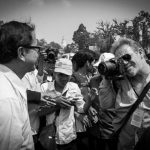 Journalist Craig Skehan at work during the mourning for slain political activist Kem Ley. 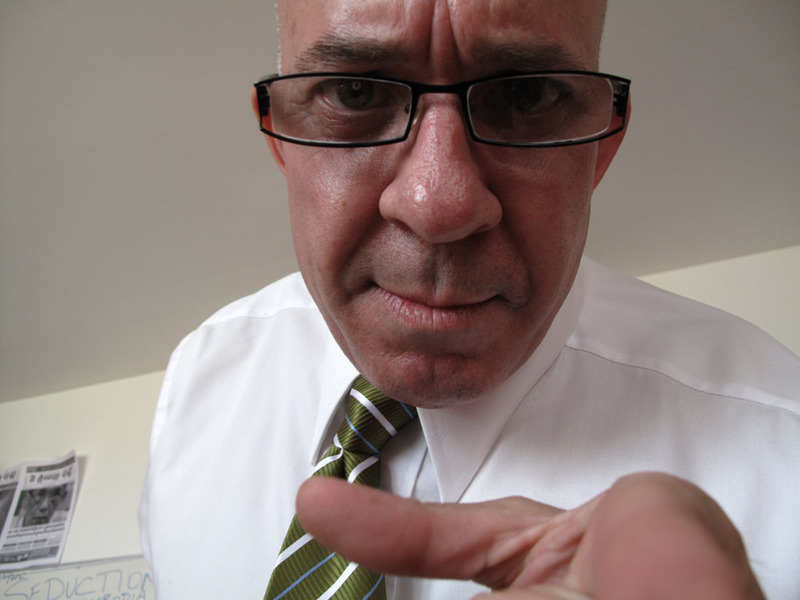 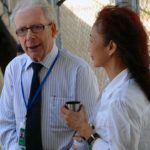 Journalist and OPCC member Irwin Loy. 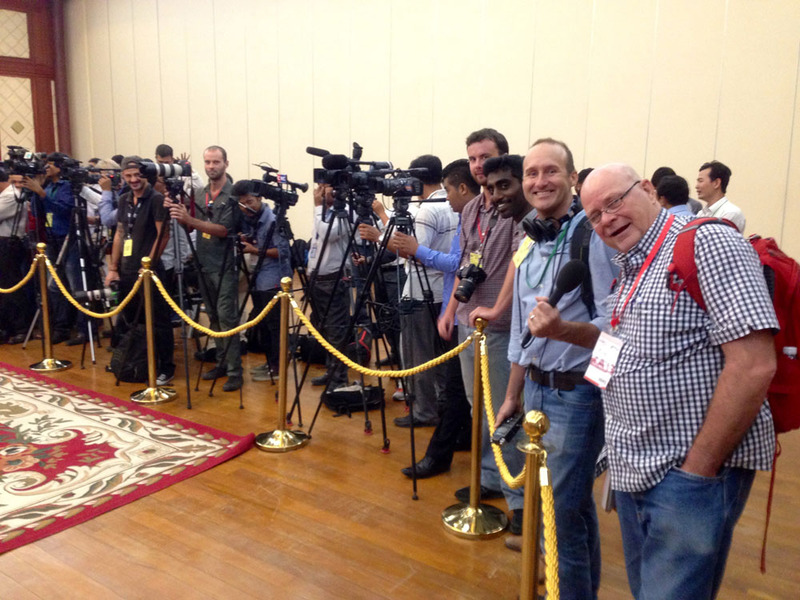 Journalists Lindsay Murdoch and Robert Carmichael waiting on Australian Immigration Minister Scott Morrison. 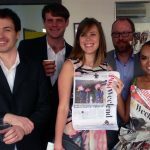 At the launch of the Post Weekend. 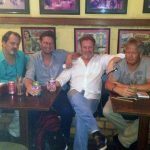 From Left to right Shane Worrell, Poppy McPherson, Bennett Murray, Chad Williams. 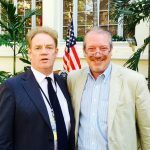 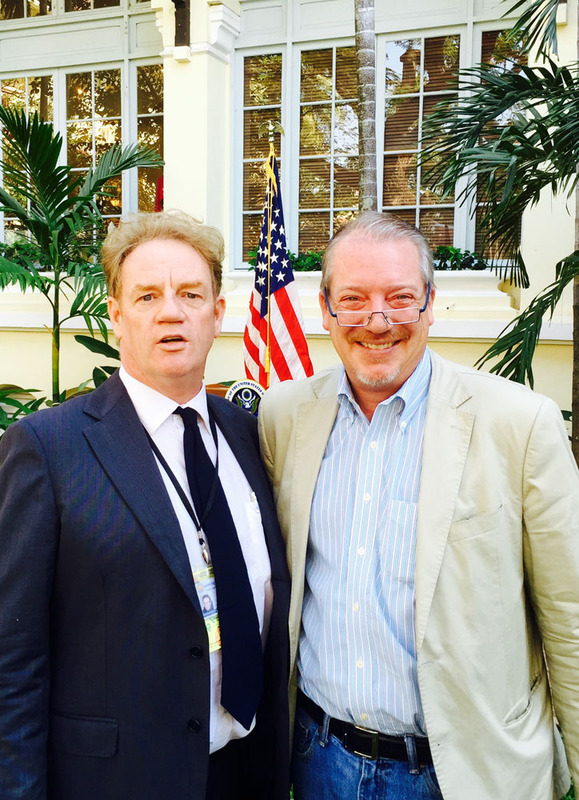 Photographer Gary Knight with journalist Kevin Doyle. 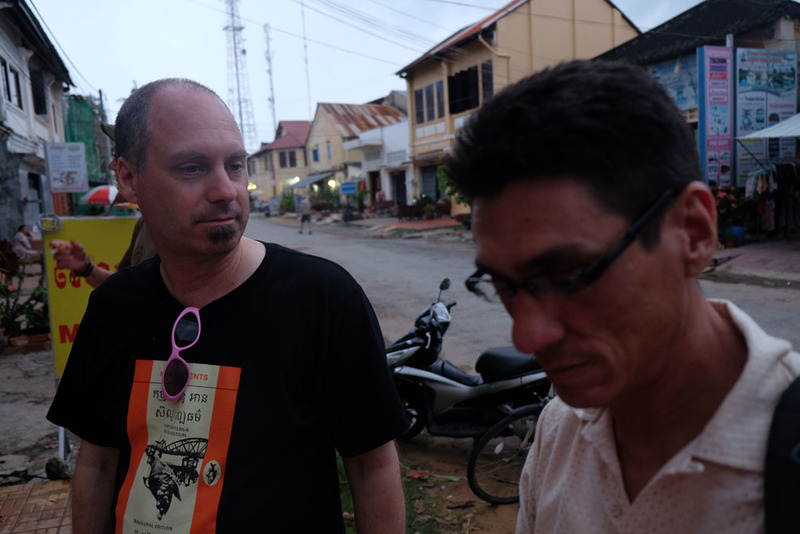 Craig Etcheson and editor of the Phnom Penh Post Alan Parkhouse. 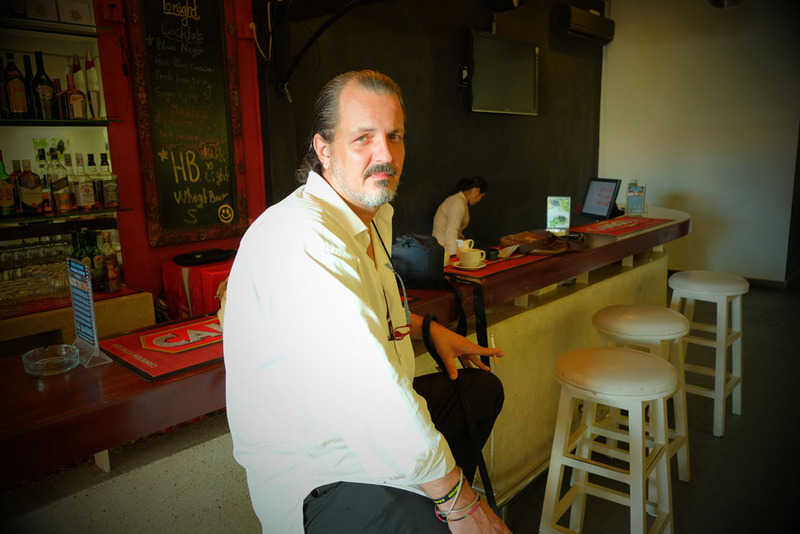 Photographer Martin Flitman at Cantina on Sisowath. 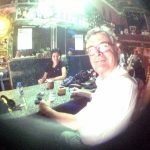 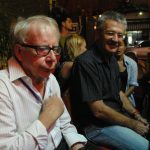 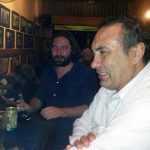 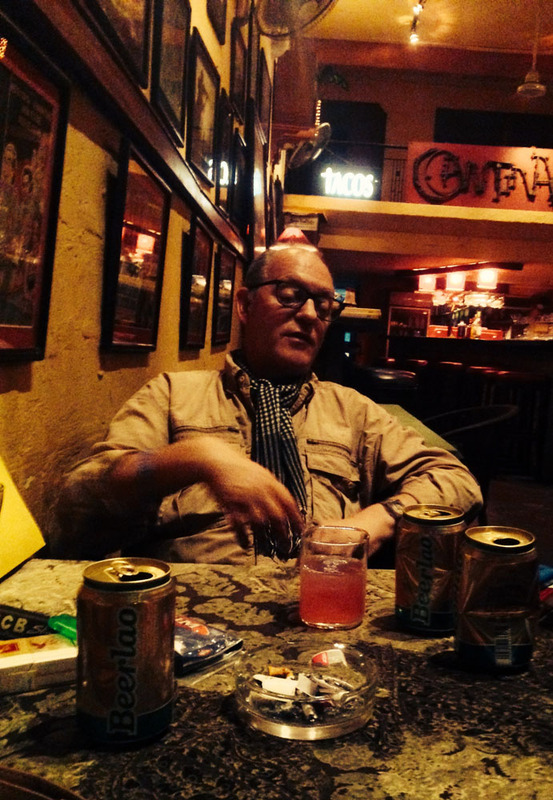 Journalist David Boyle with academic Ray Leos enjoy and ale at Cantina in Phnom Penh. 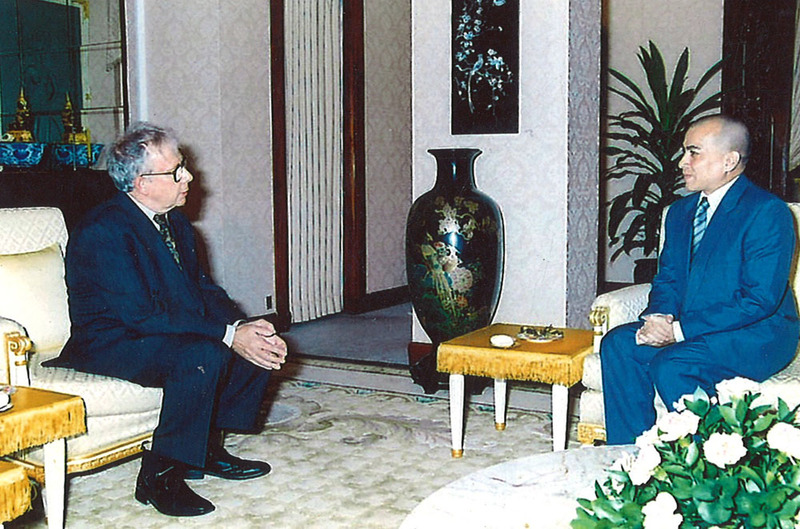 Past presidents, Luke Hunt and Matt Lee during a visit by US Secretary of State John Kerry. 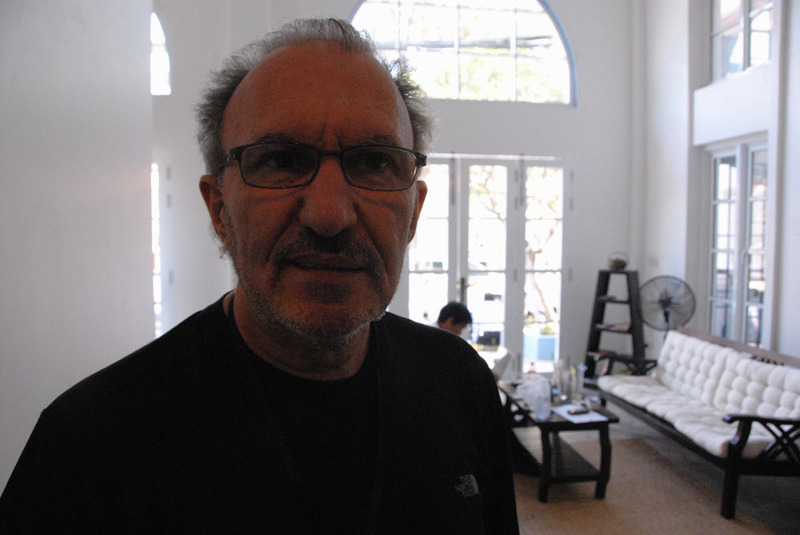 Journalist and former OPCC board member Terry Friel. 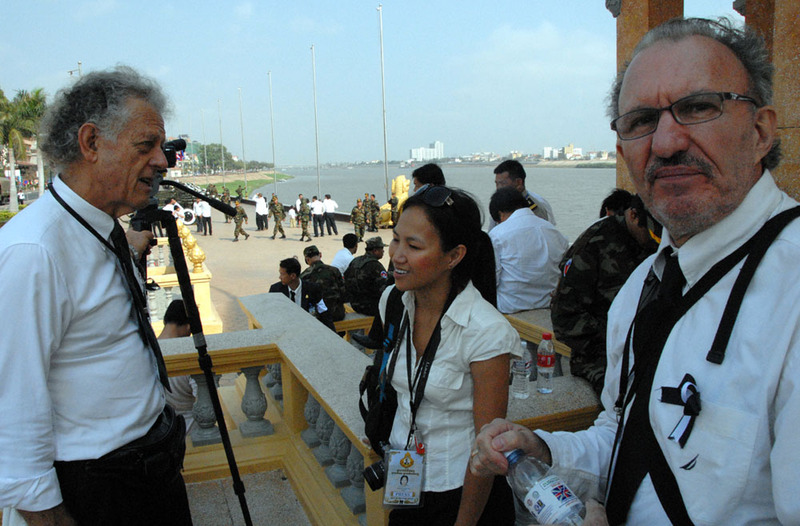 Journalists Rupert Winchester (with Harley) and Terry Friel at the White building in Phnom Penh. 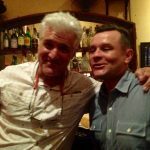 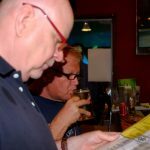 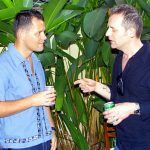 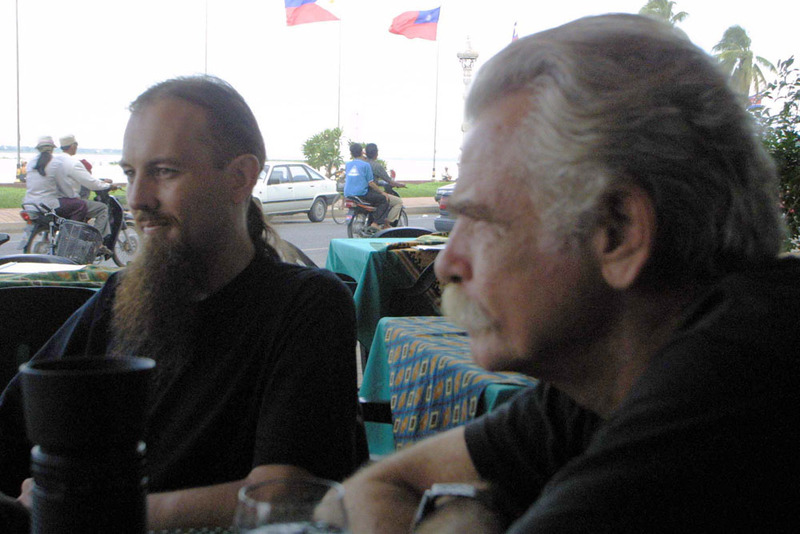 Musician Scott Bywater and OPCC board member Robert Starkweather at the 2015 inaugural Kampot Readers and Writers Festival. 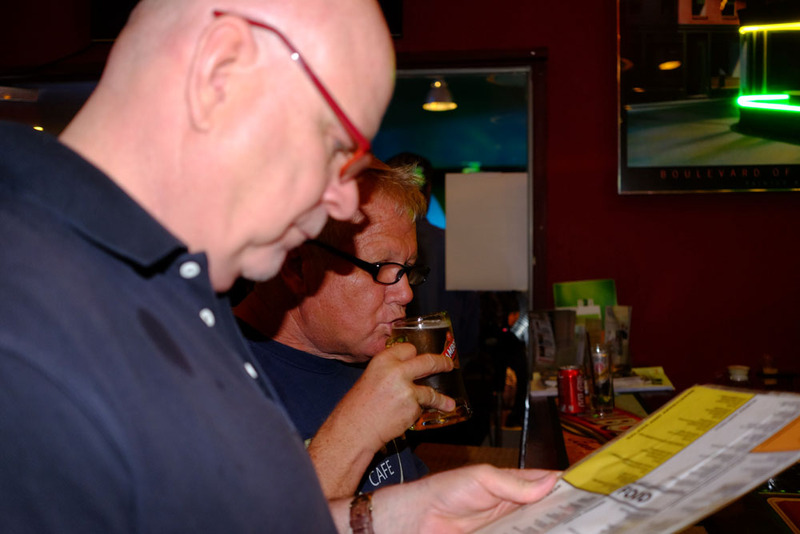 Starkweather was a founding organizer of the festival. 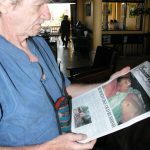 OPCC board member with former president Robert Starweather inspect the first issue of the Mekong Review at the 2015 Kampot Readers and Writers Festival. 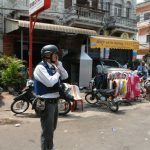 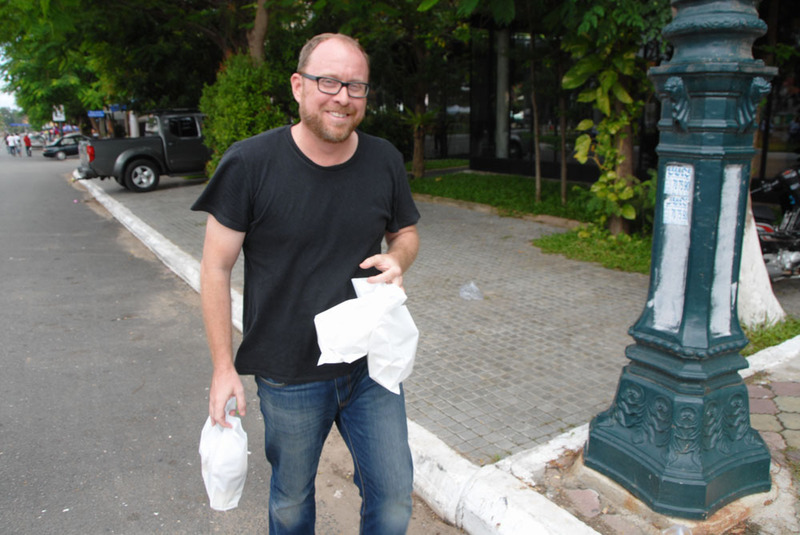 Film maker Craig Skehan working the streets of Phnom Penh. 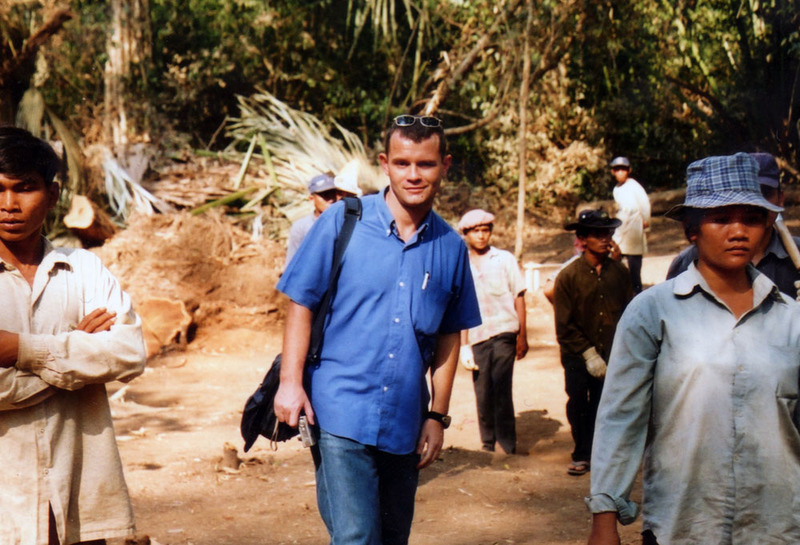 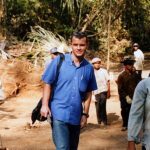 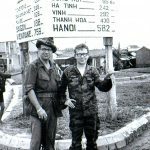 Journalist Kevin Doyle in northeast Cambodia during a US mission to retrieve the bones of MIAs from the Vietnam War. 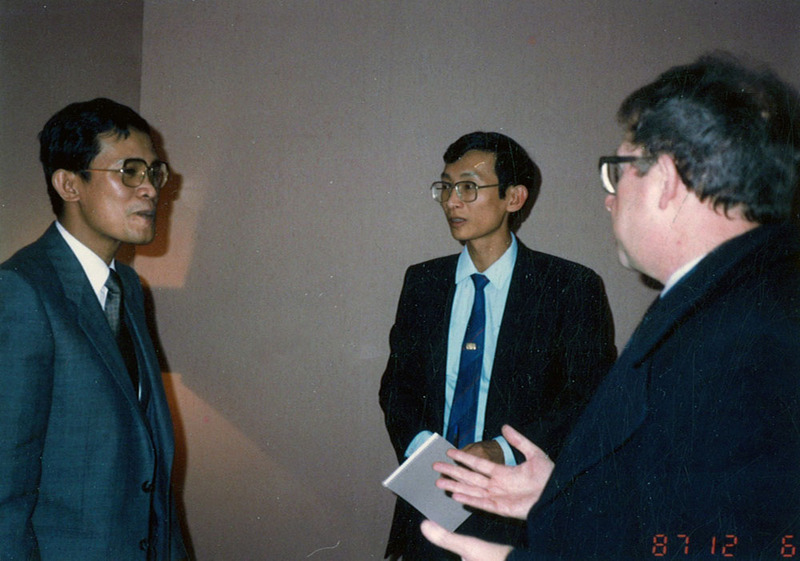 Opposition leader Sam Rainsy and journalist Luke Hunt. 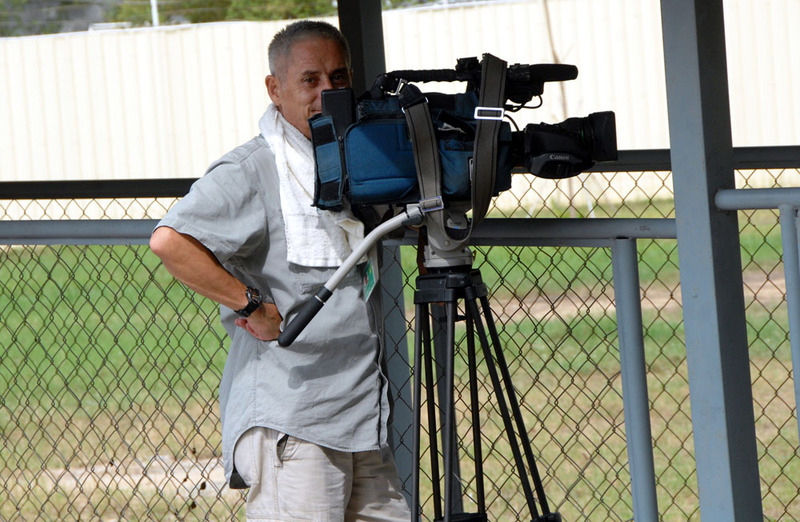 Former OPCC President and AP correspondent Chris Dechard. 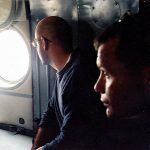 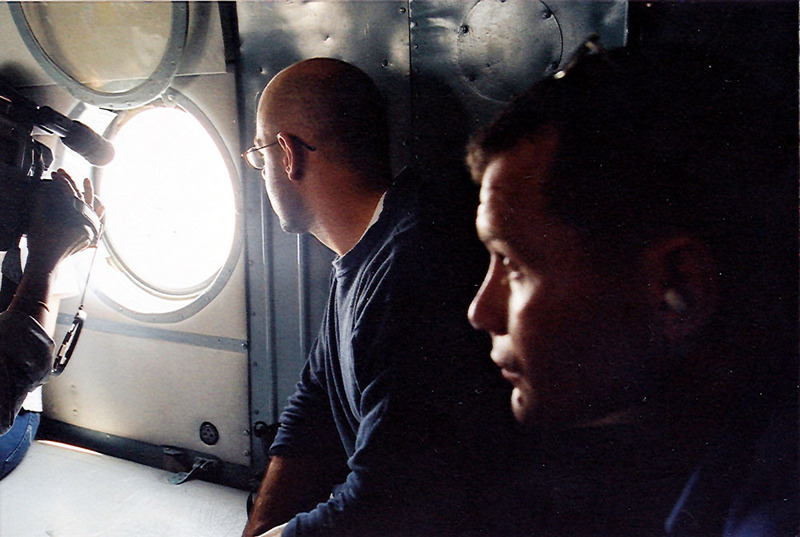 Aboard a helicopter on a US military mission to retrieve the bones of US servicemen shot down during the Vietnam War. 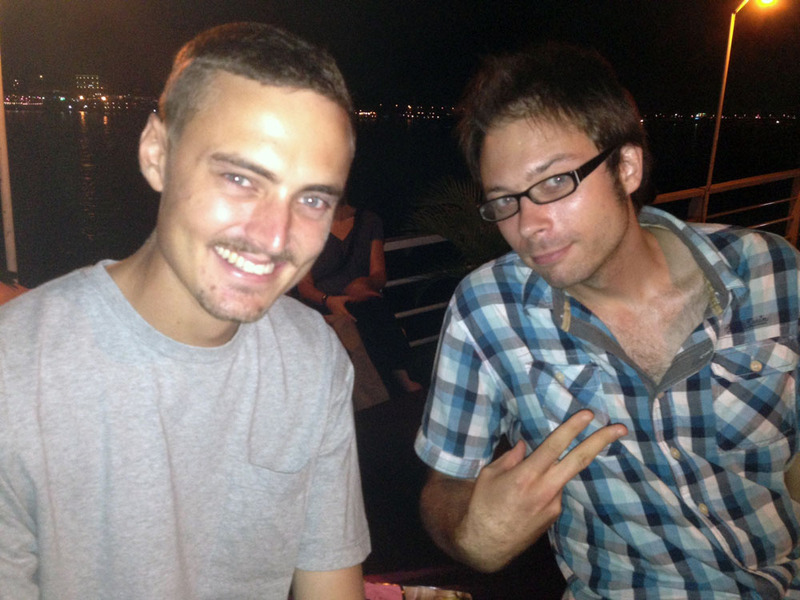 Seth Meixner and Kevin Doyle. 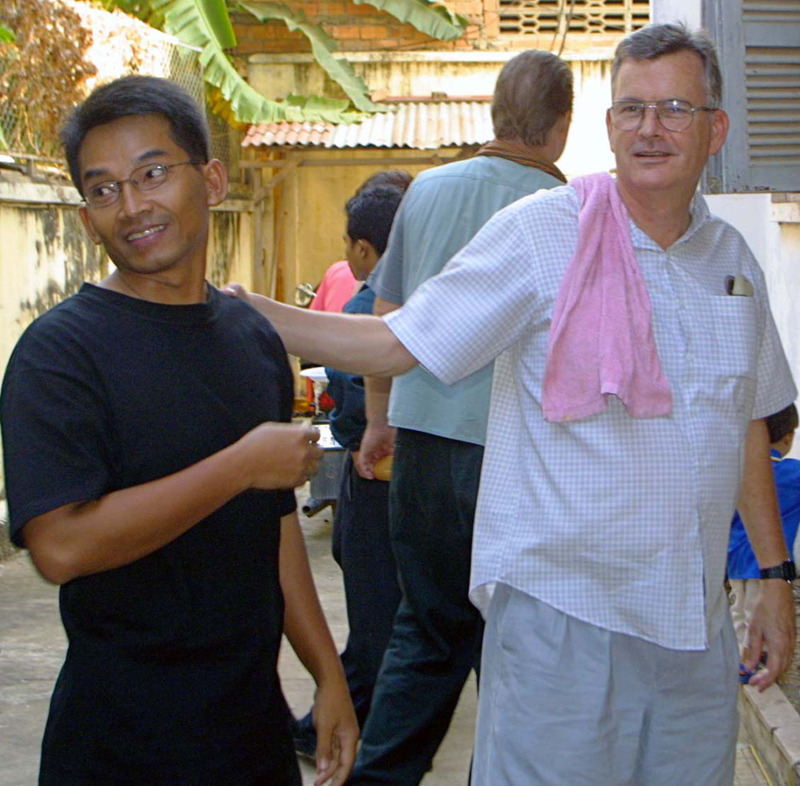 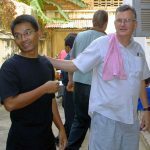 Former OPCC president Robert Carmichael and Dar Seng during the Water Festival. 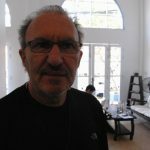 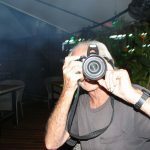 Photographer and OPCC life member Al Rockoff. 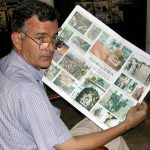 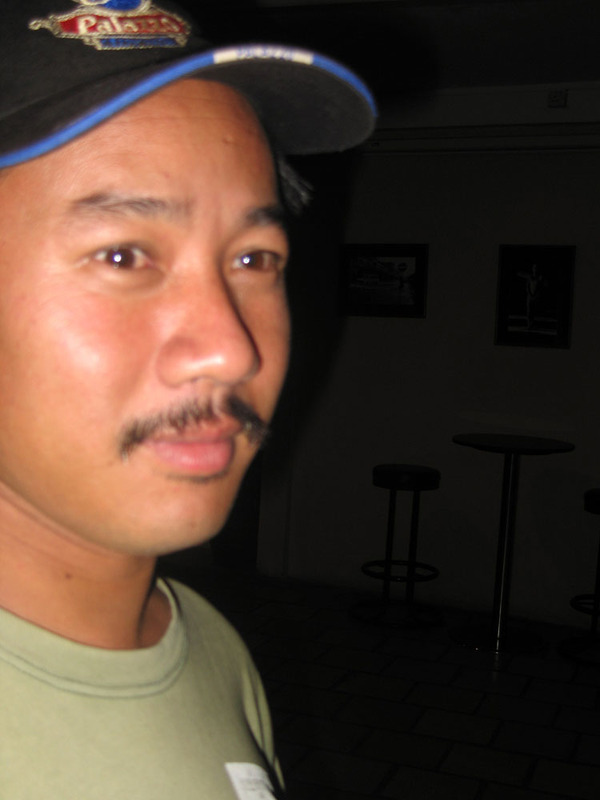 Chad Williams, editor of the Phnom Penh Post. 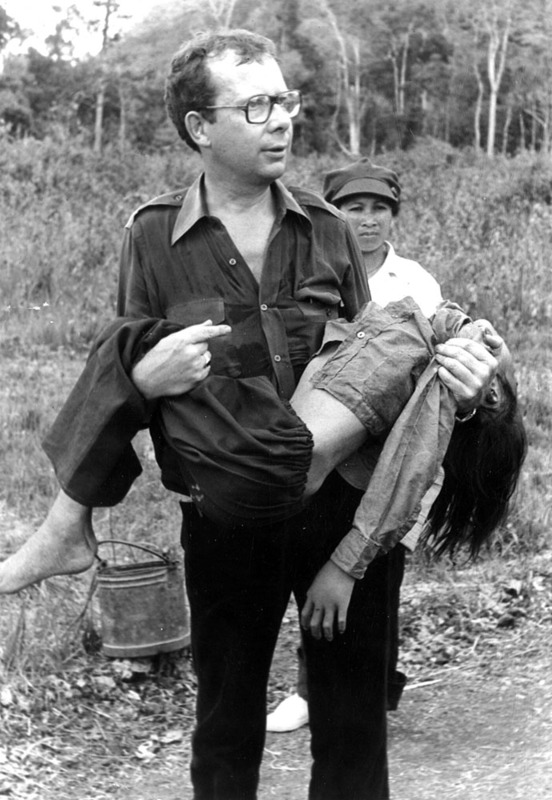 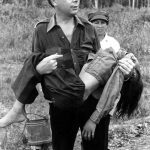 Journalist Sotheavy Nou and her father. 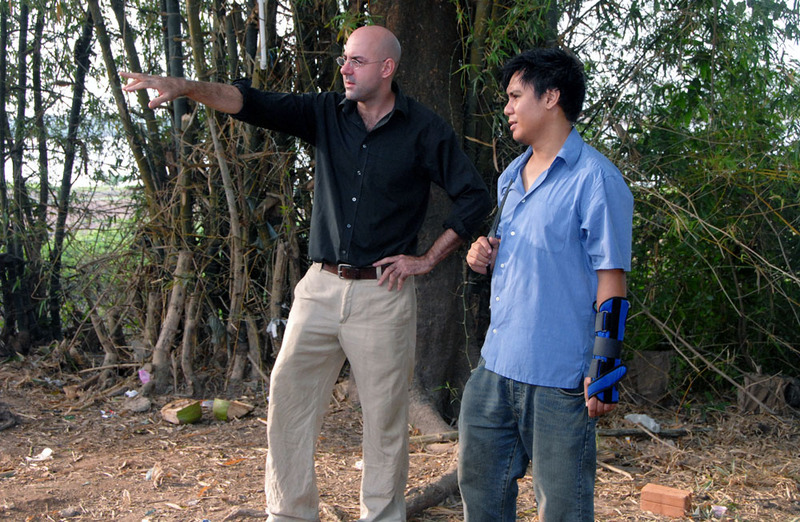 Dressed for a riot, journalist Rick Valenzuela. 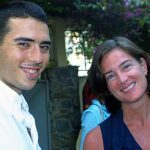 Journalists Rick Valenzuela and Denise Hruby. 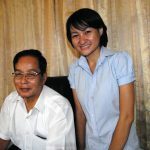 Former Cambodian prime minister Pen Sovann and Cambodian journalist Sokunthea Hang. 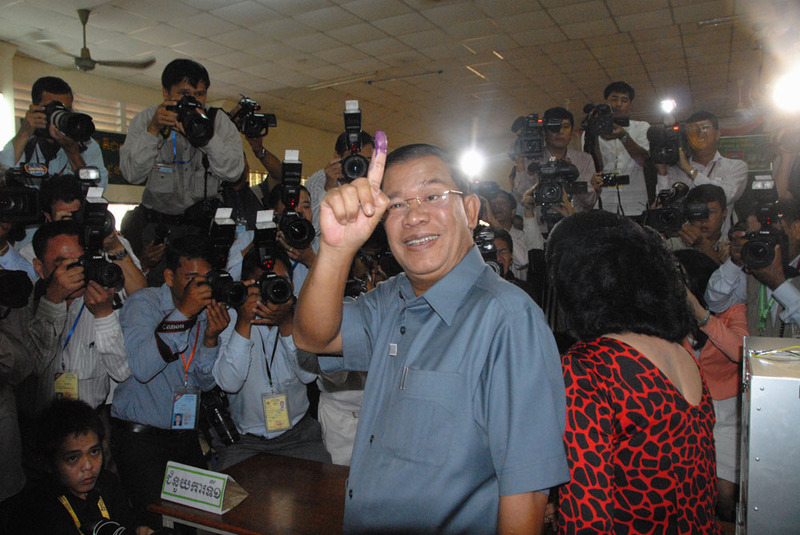 Cambodian Prime Minister Hun Sen votes in the 2013 elections. 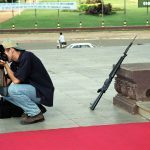 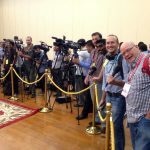 Photographer Tim Page at the 2013 elections, waiting for Hun Sen. 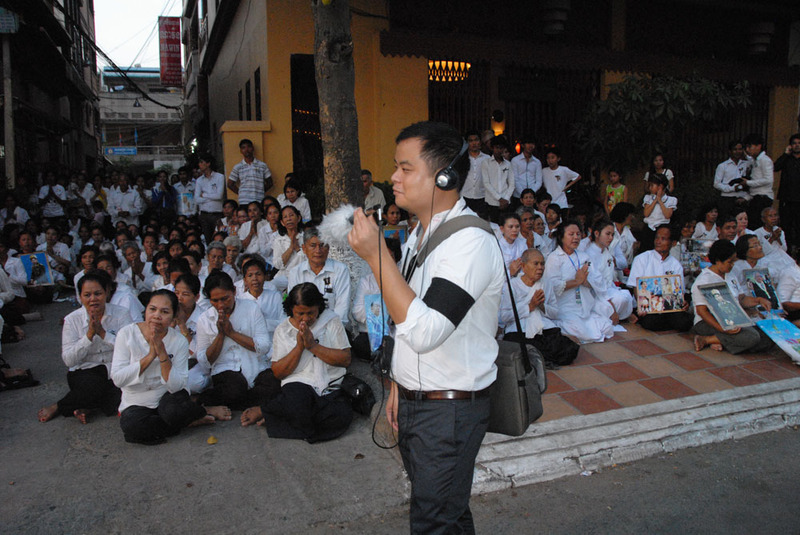 Journalist Manny Muang during campaigning for the 2013 election. 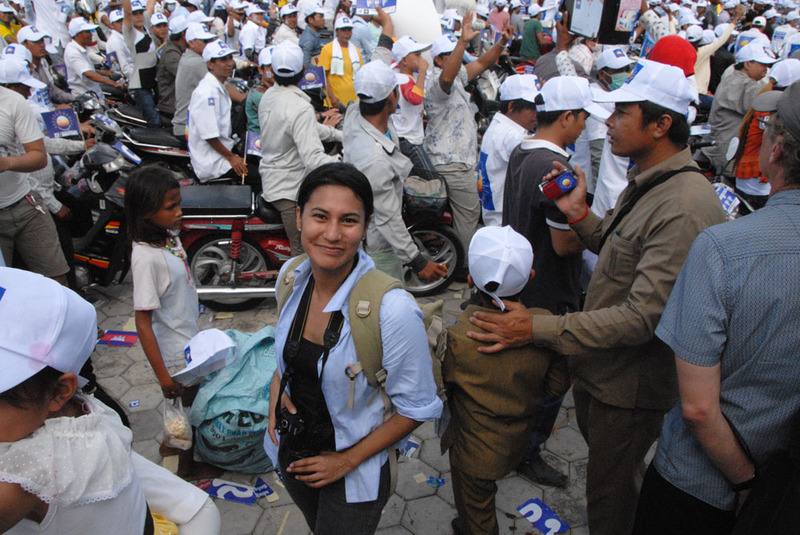 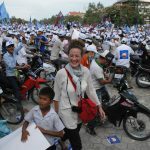 Journalist Stephanie Giry during an opposition campaign for the 2013 election. 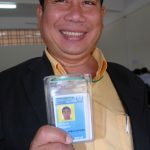 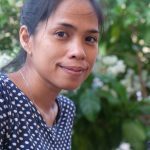 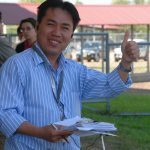 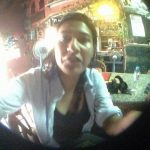 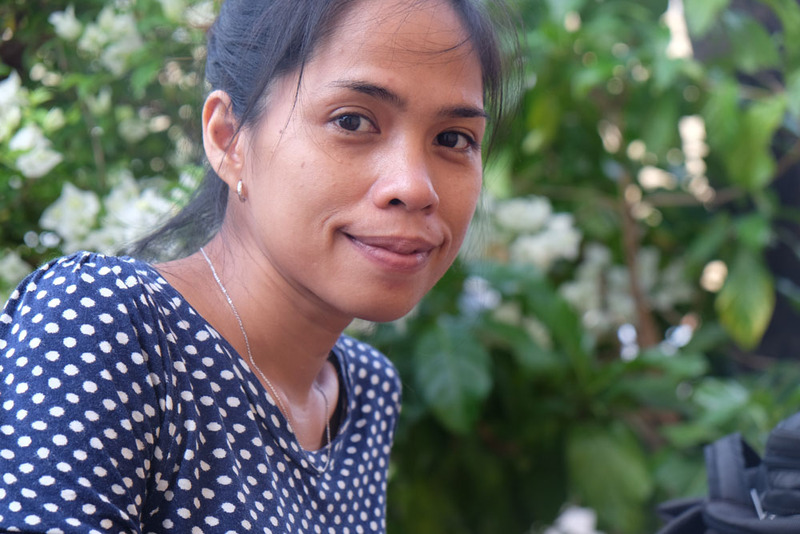 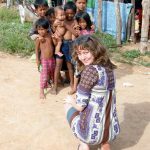 Khmer journalist Chantrea Koeut Urgell. 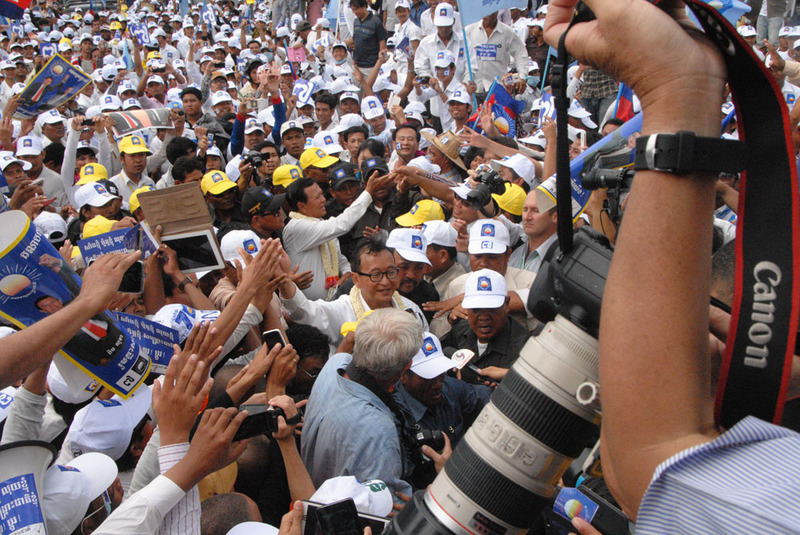 Opposition leader Sam Rainsy campaigning ahead of elections in 2013. 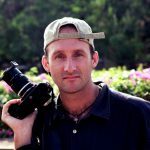 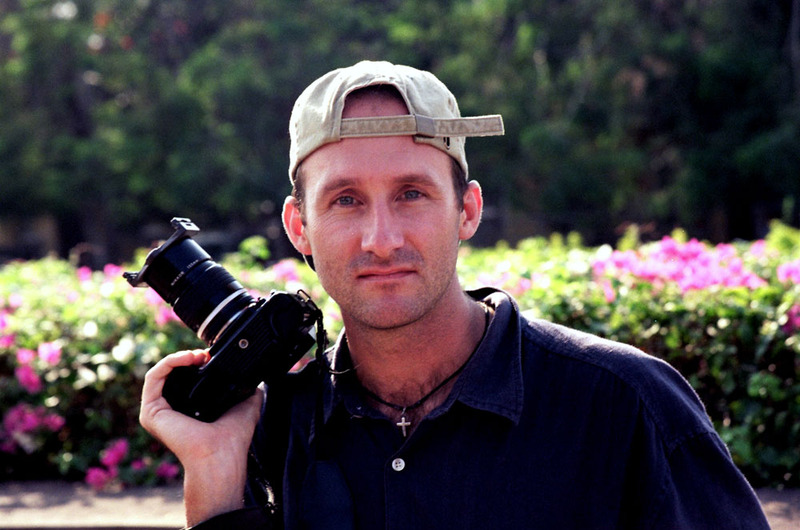 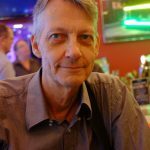 Journalist, photographer and author Robert Carmichael. 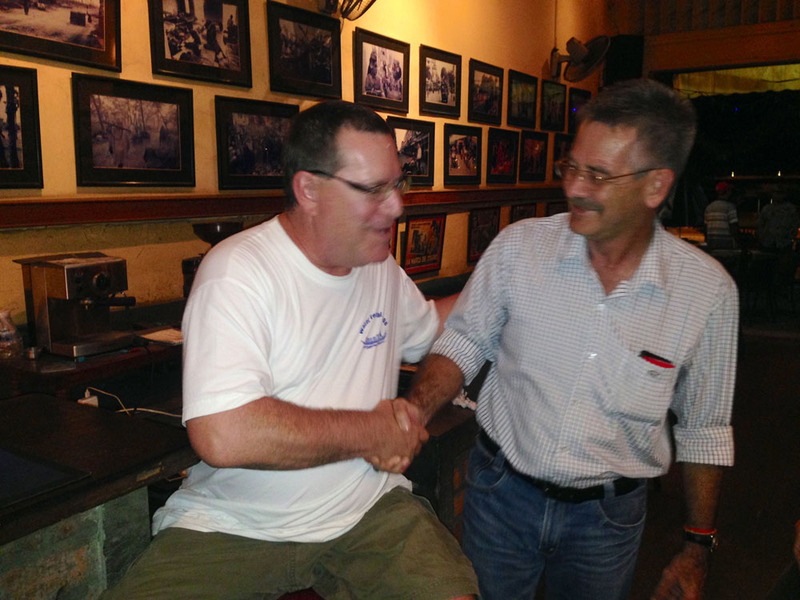 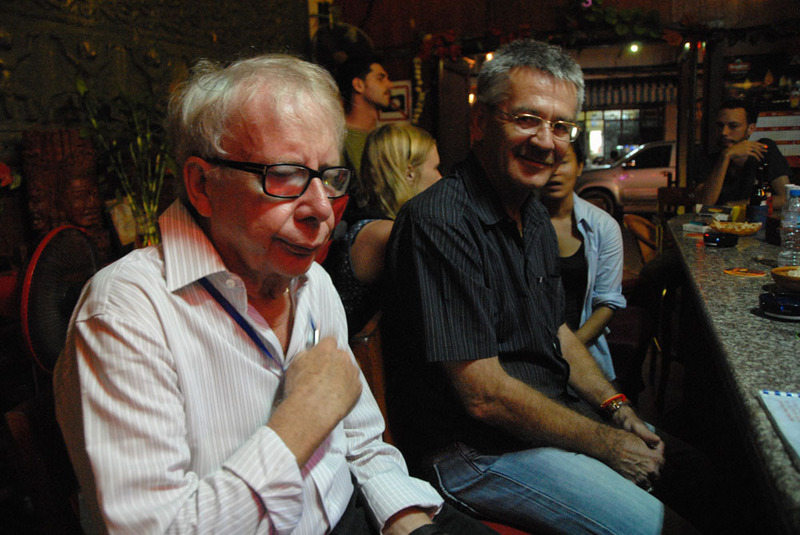 OPCC life member Jim Pringle and Alan Parkhouse, editor of the Phnom Penh Post, 2013. 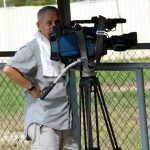 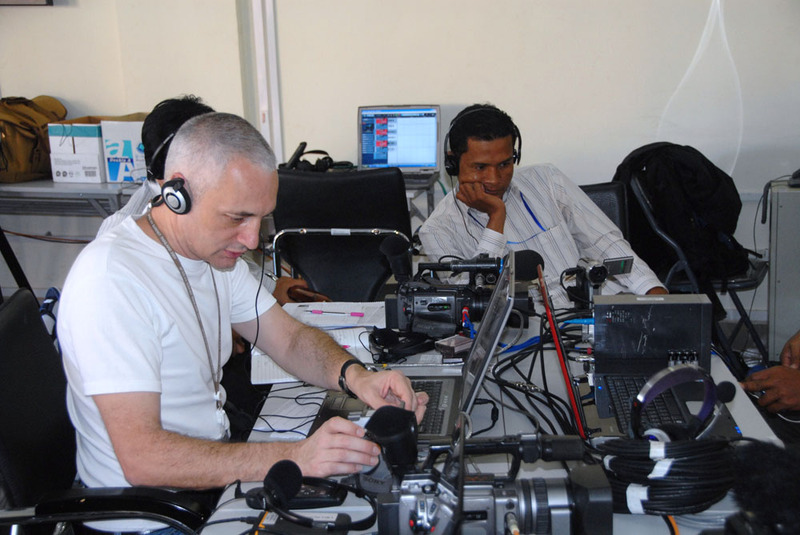 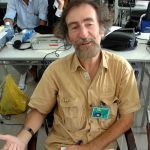 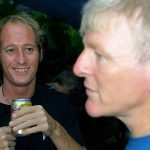 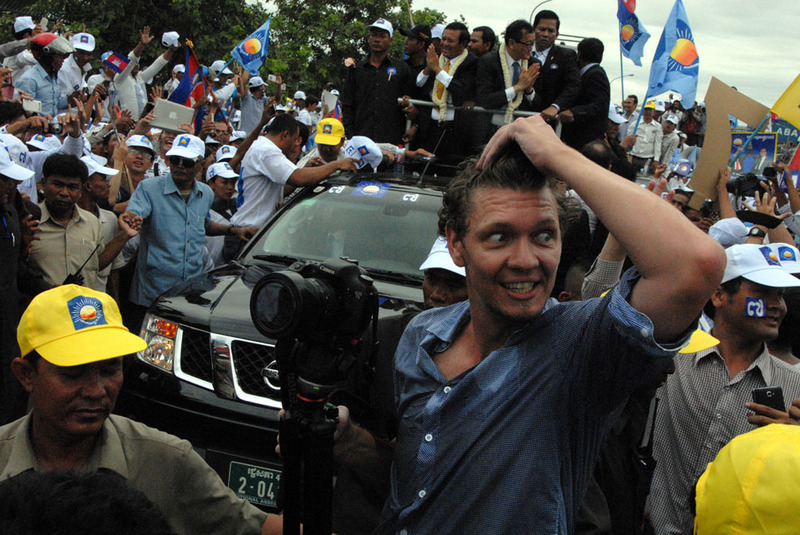 Cameraman and journalist Daniel de Carteret during Sam Rainy’s return from exile in 2013. 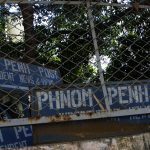 Phnom Post, the old days. 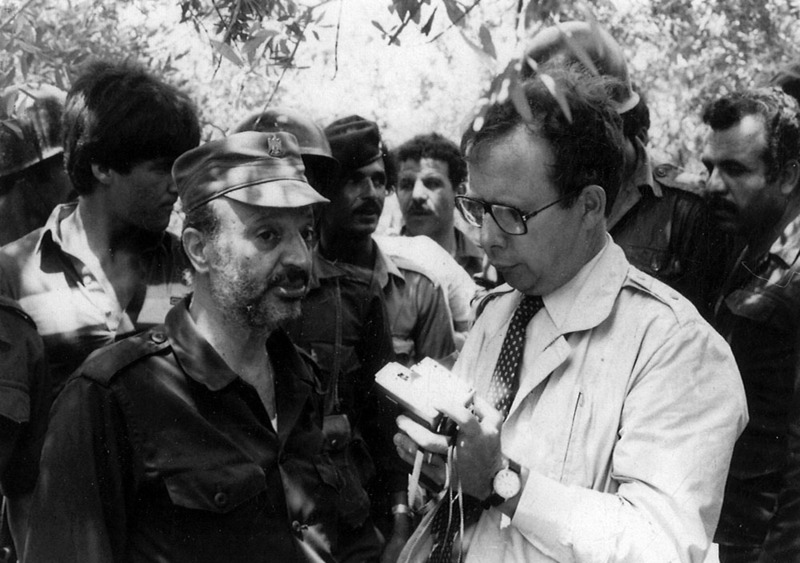 Radio journalist and longtime OPCC member Irwin Loy. 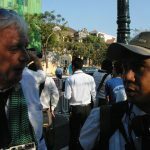 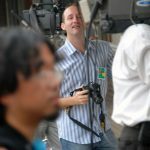 Photographer Tim Page with journalist and former OPCC President Rick Valenzuela during the funeral for King Father Norodom Sihanouk. 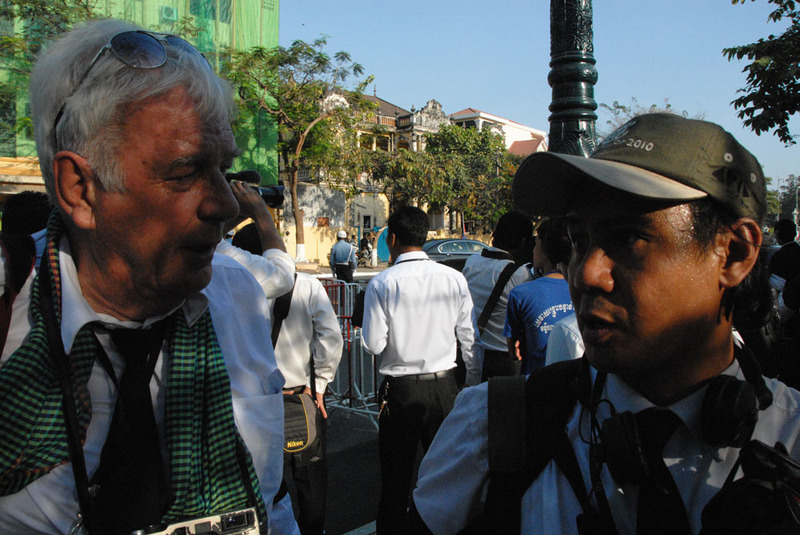 Photographer Roland Neveu during the funeral for the later King Father Norodom Sihanouk. 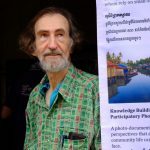 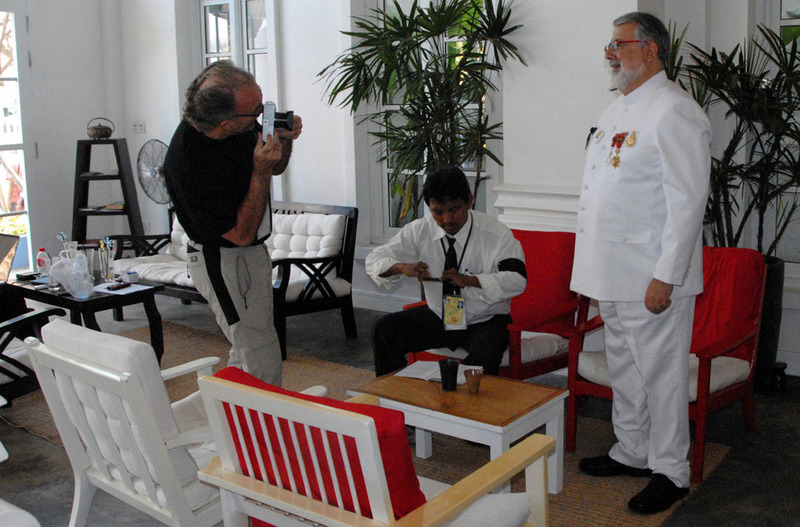 Roland Neveu taks a photo of Julio Jeldres, biographer of King Father Norodom Sihanouk. 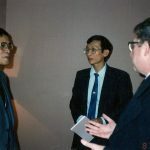 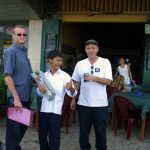 Film maker James Gerrand, journalist Lien Hoang and photographer Roland Neveu. 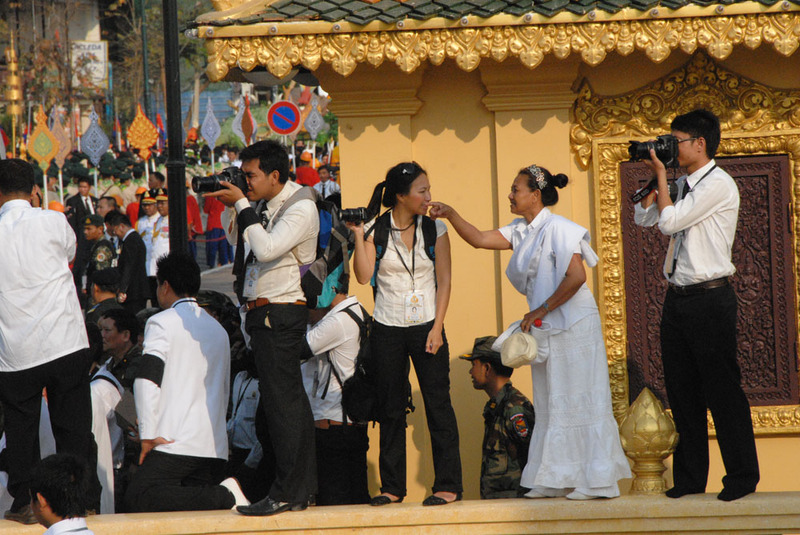 Photographers line up during the funeral of the late King Father Norodom Sihanouk. 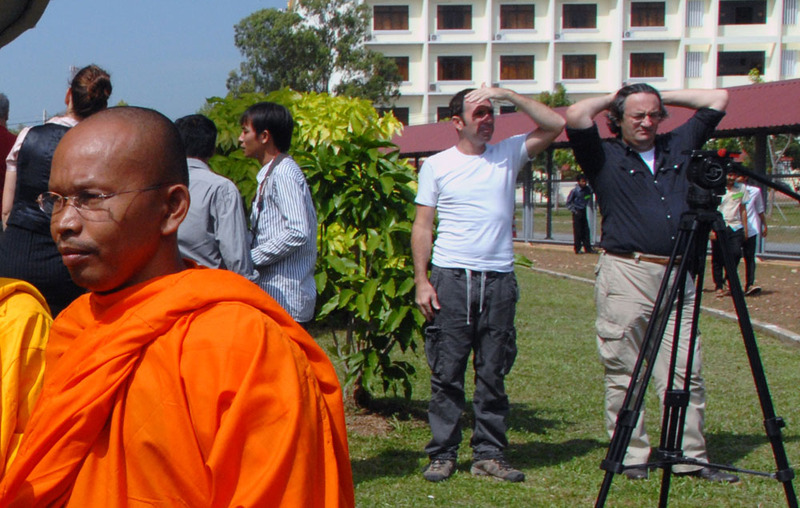 Roland Neveu (centre) and Khmer photographers during the funeral for the late King Father Norodom Sihanouk. 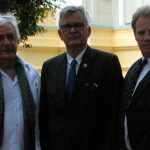 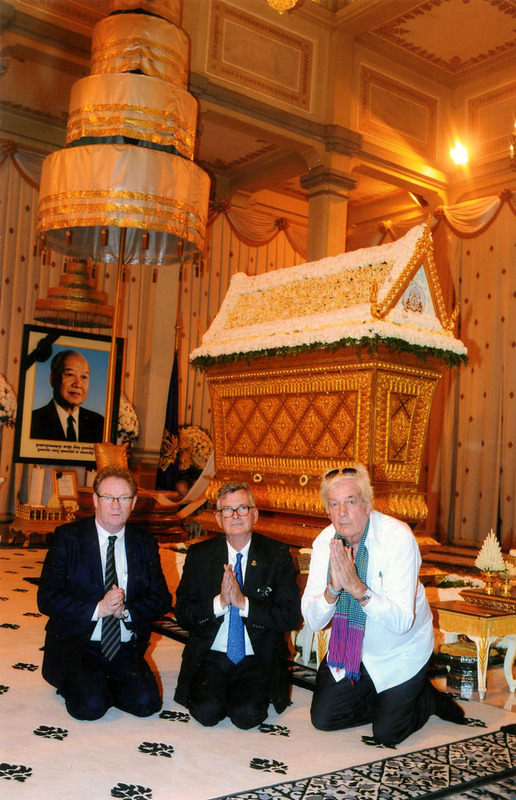 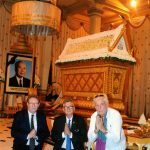 Journalist Luke Hunt with former publisher Michael Hayes and photographer Tim Page at the casket of the late King Father Norodom Sihanouk. 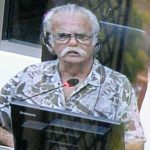 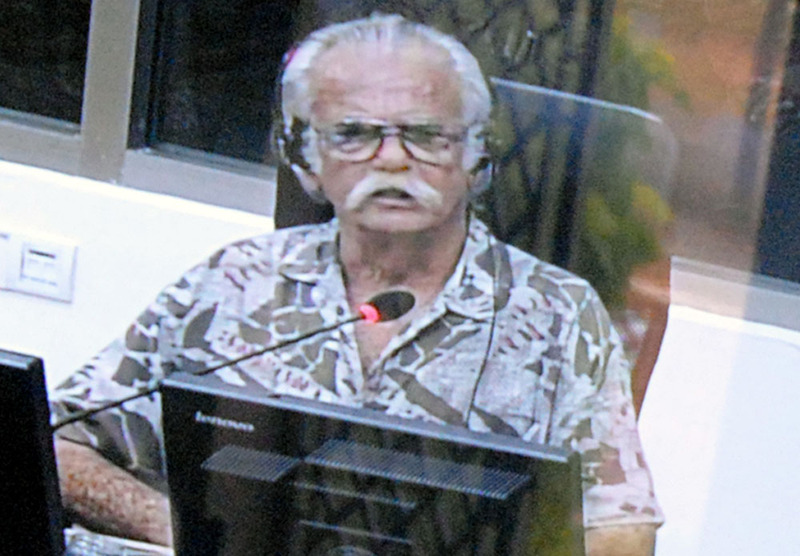 Photographer Al Rockoff gives evidence at the Khmer Rouge Tribunal. 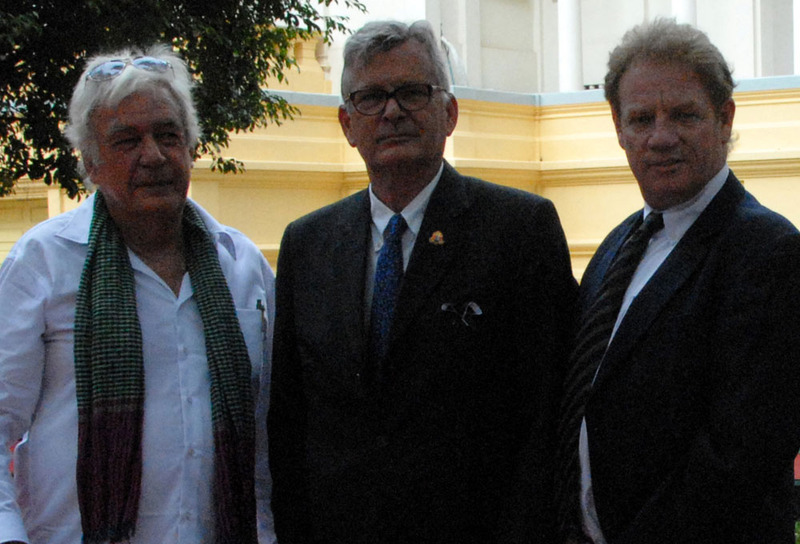 Photographer Tim Page, former publisher Michael Hayes and journalist Luke Hunt inside the royal palace. 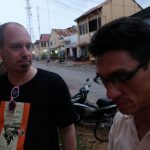 Photographer John Vink caught in a scuffle during a protest involving activist Theary Seng (right). 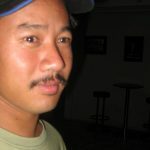 Former OPCC president Rick Valenzuela. 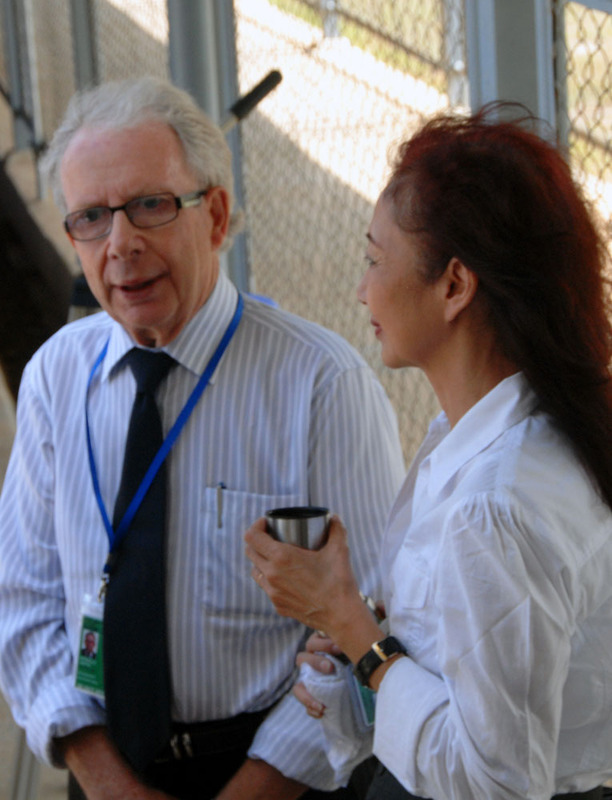 OPCC life member Jim Pringle with wife Milly at the Khmer Rouge Tribunal. 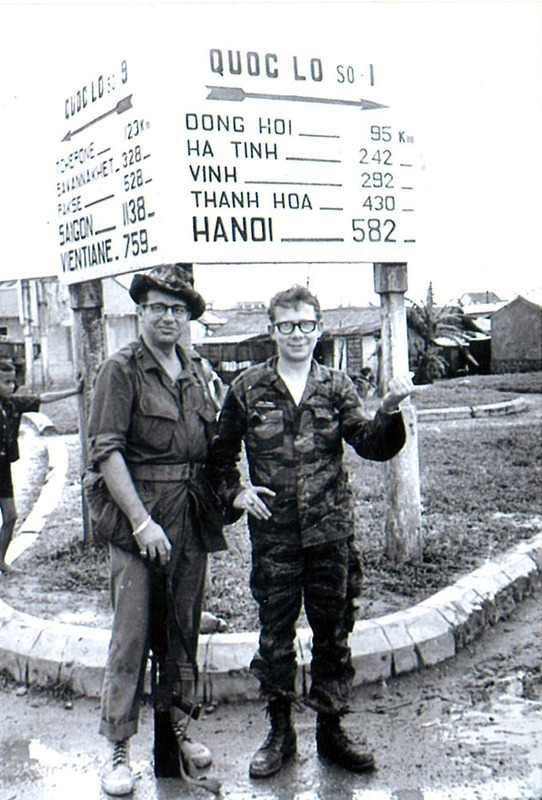 Journalist Faine Greenwood and photographer Al Rockoff at the Khmer Rouge Tribunal. 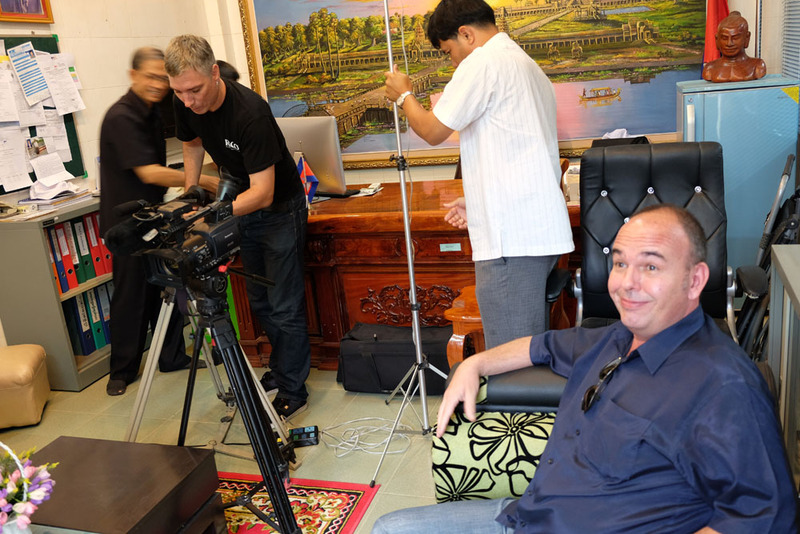 BBC film crew at the Khmer Rouge Tribunal. 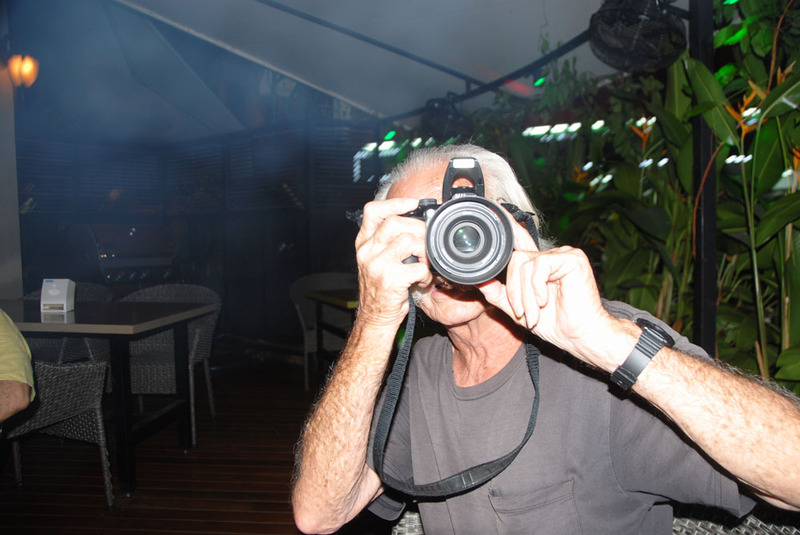 Photographer Al Rockoff takes a selfie with journalist Faine Greenwood. 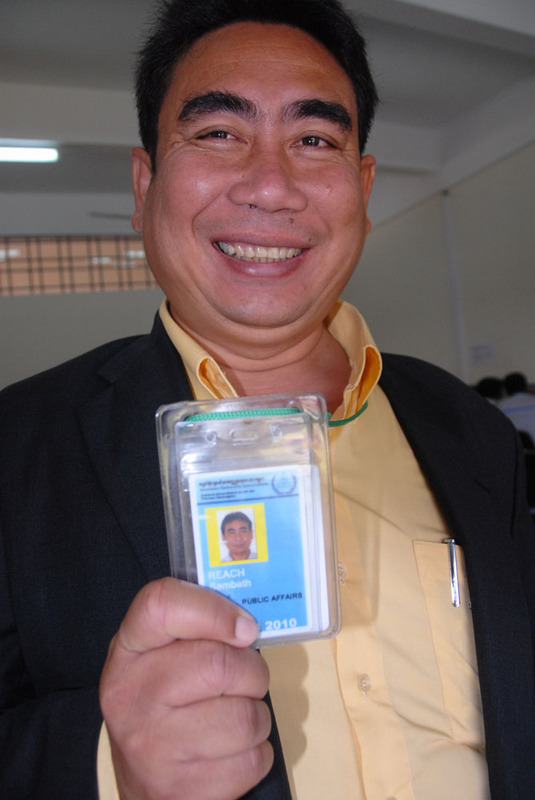 AFP journalist Suy Se at the Khmer Rouge Tribunal. 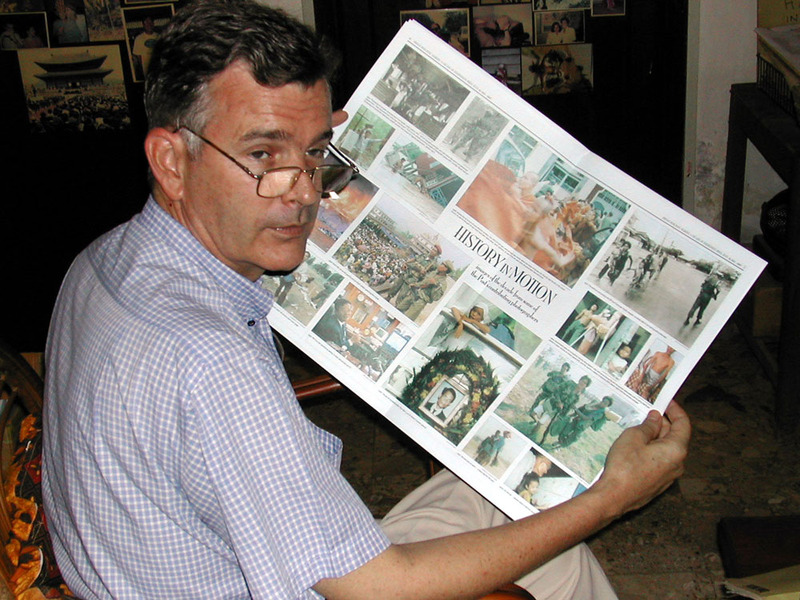 Journalist Tom Fawthrop at the Khmer Rouge Tribunal. 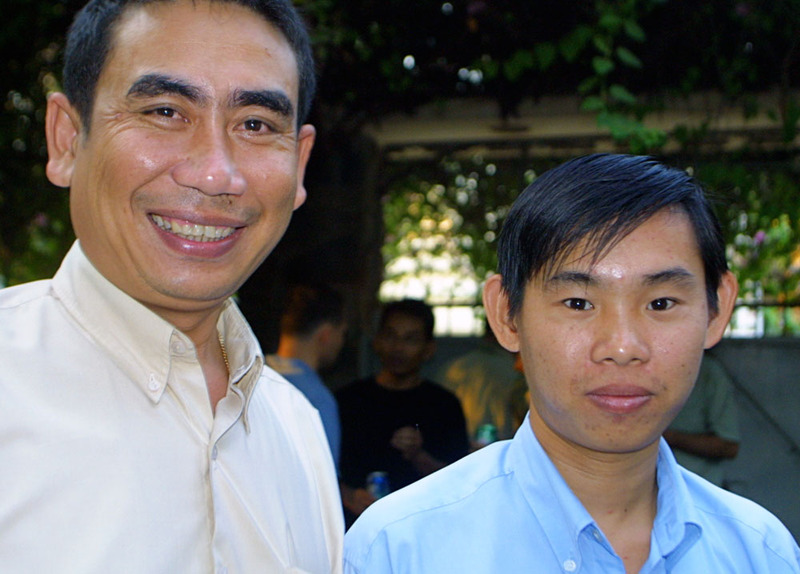 Activist Theary Seng and film maker Marc Eberle at the Khmer Rouge Tribunal. 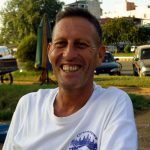 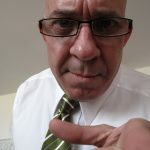 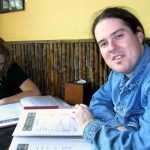 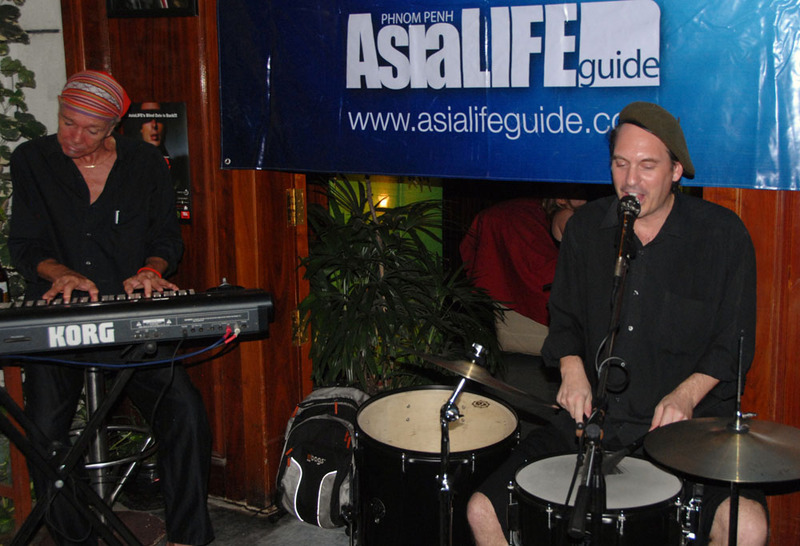 AsiaLIFE owner and publisher Mark Bibby-Jackson. 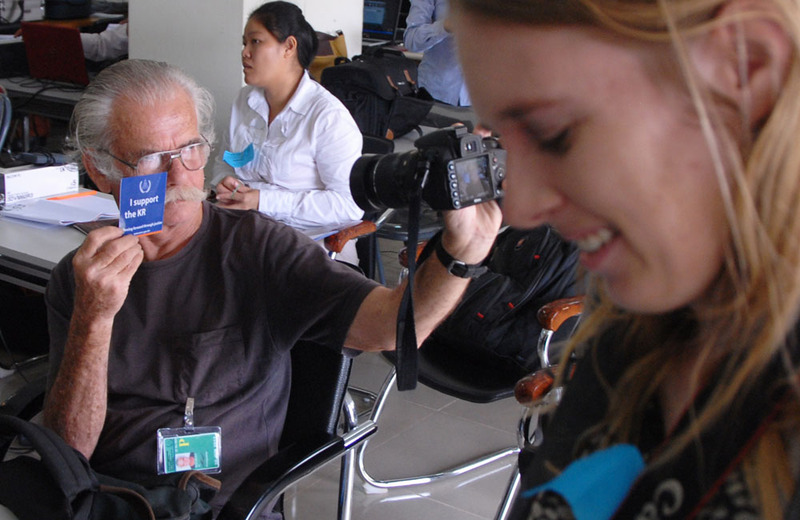 Magnum photographer John Vink at work during the Khmer Rouge Tribunal. 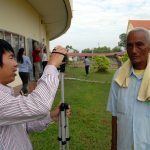 Reach Samabath, legendary Cambodia journalist and media spokesman at the Khmer Rouge Tribunal. 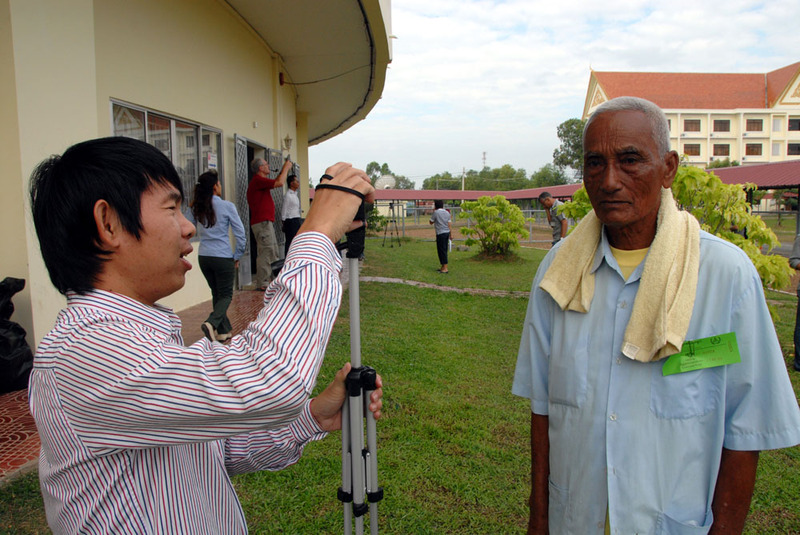 Journalist Ek Madras at the Khmer Rouge Tribunal. 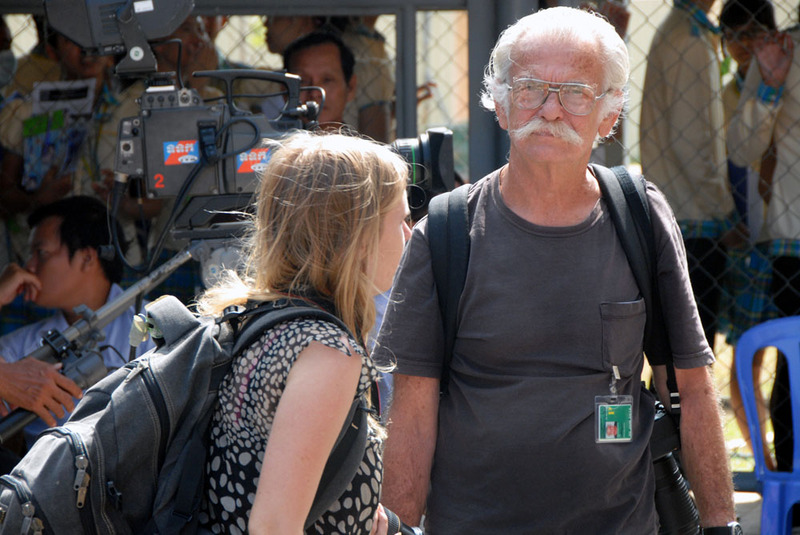 AP journalist Jerry Harmer at the Khmer Rouge Tribunal. 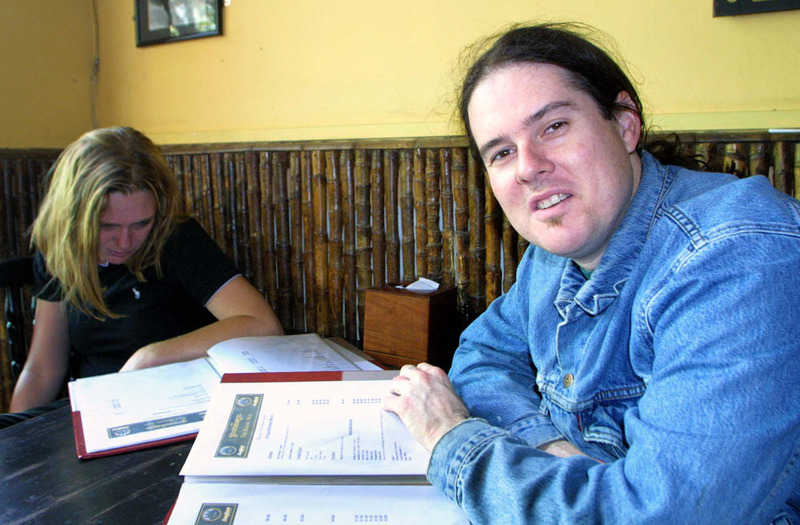 Musician Scott Bywater at Talkin’ to a Stranger. 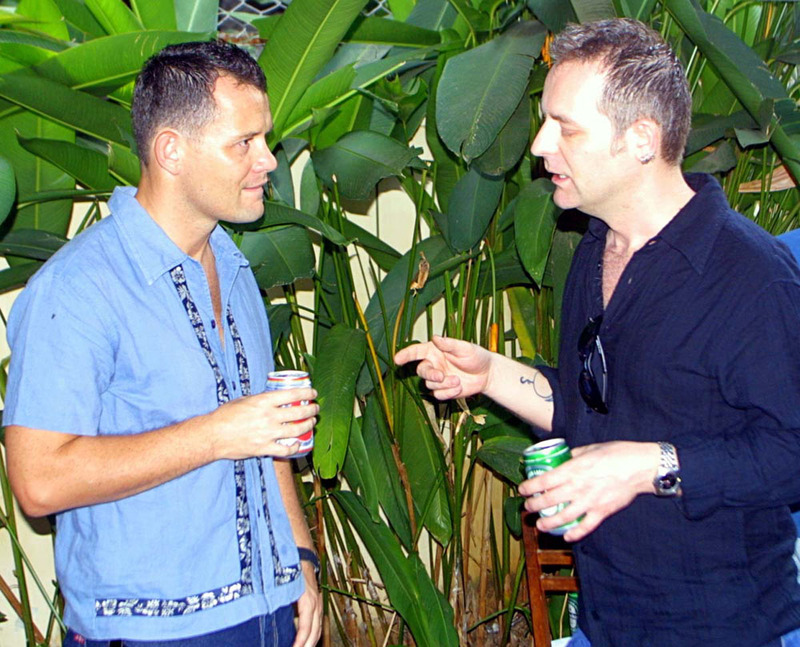 AsiaLIFE owner Mark Bibby-Jackson with Darren Gall at Talkin’ to a Stranger. 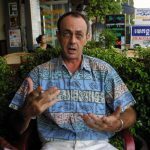 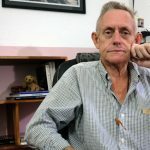 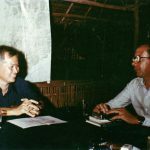 Former publisher of the Phnom Penh Post Ross Dunkley. 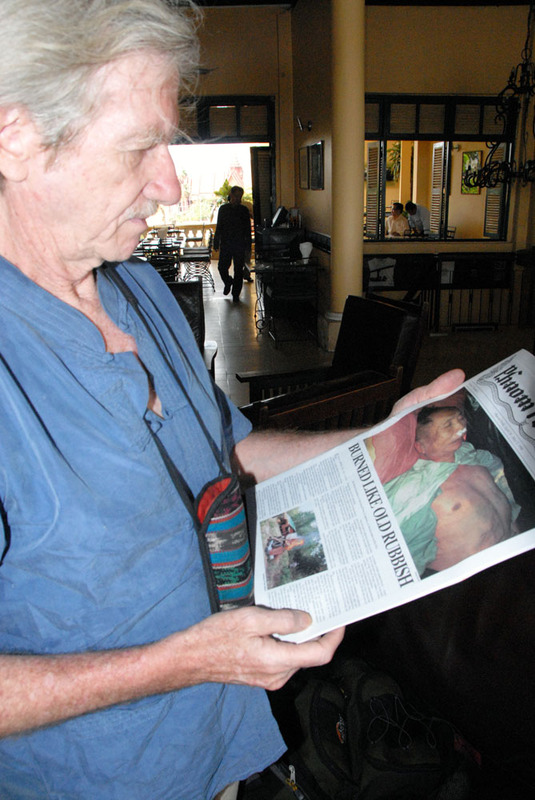 Front page of the Phnom Penh Post announcing the death of Pol Pot. 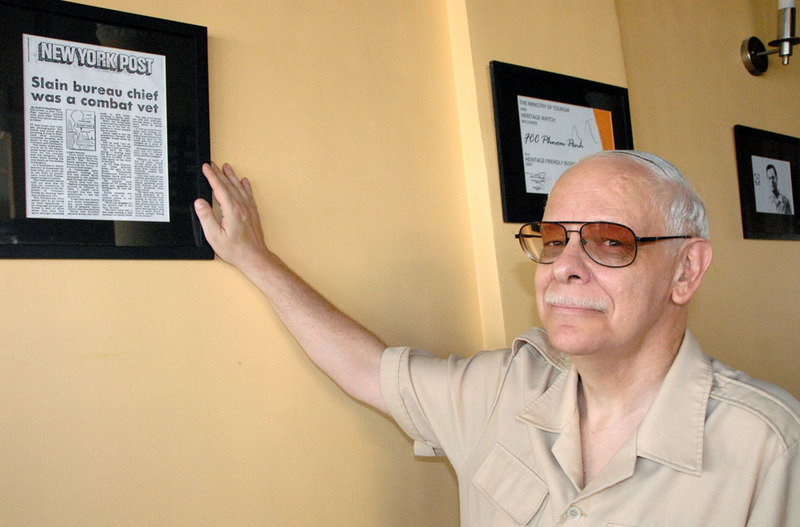 A story is framed and hung in memory of the legendary war correspondent Neil Davis. 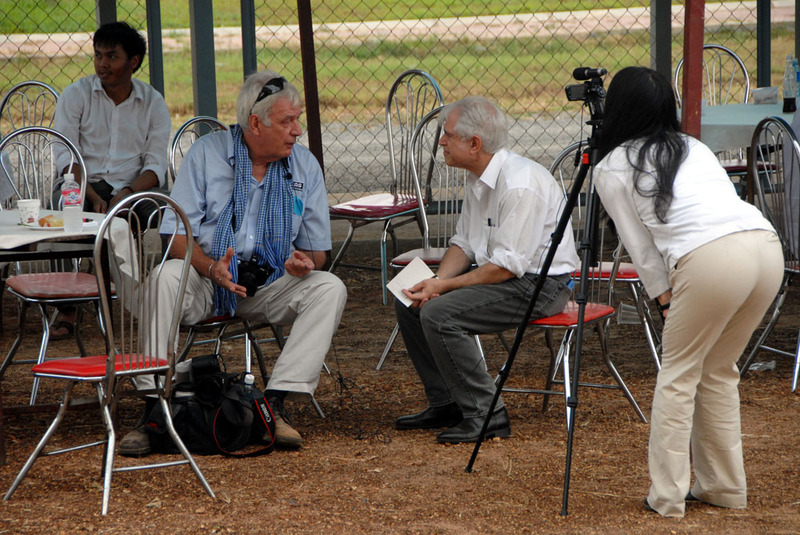 Photographer Tim Page is interviewed by Seth Mydans of the New York Times outside the Khmer Rouge Tribunal. 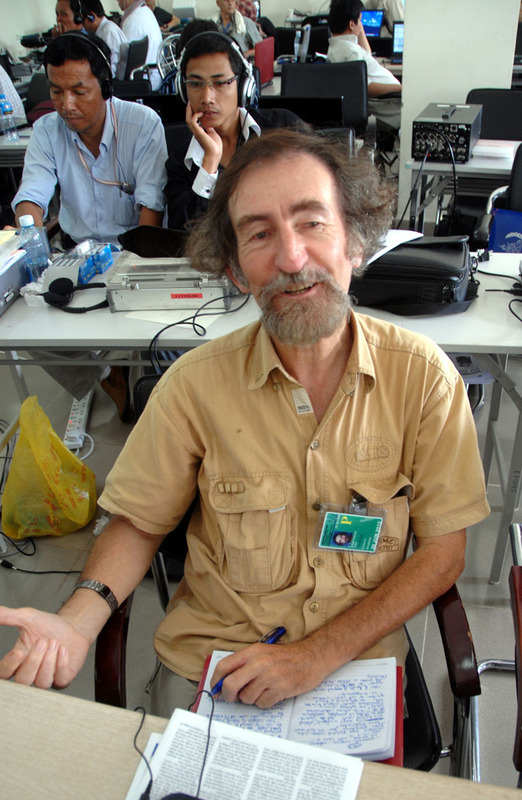 Journalist Rob Carmichael at the Khmer Rouge Tribunal. 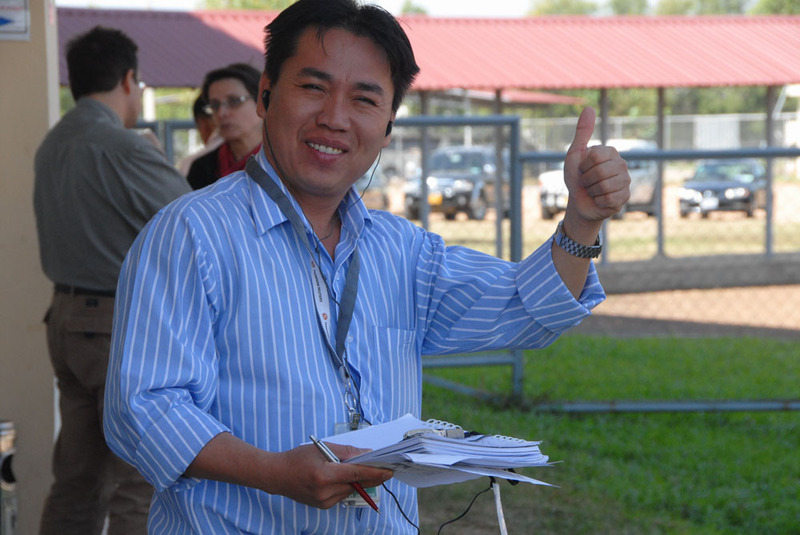 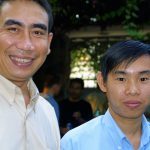 Journalist and OPCC life member Vinh Dao and AP journalist Jerry Harmer. 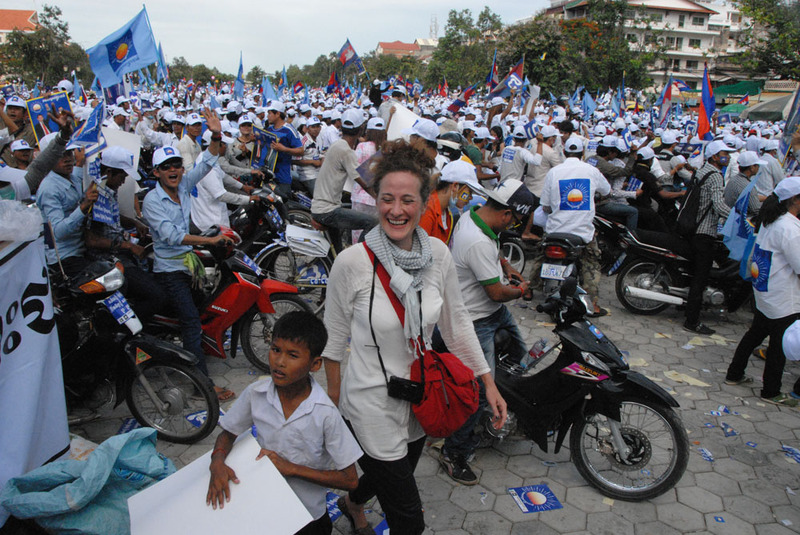 Helen Jarvis is interviewed outside the Khmer Rouge Tribunal. 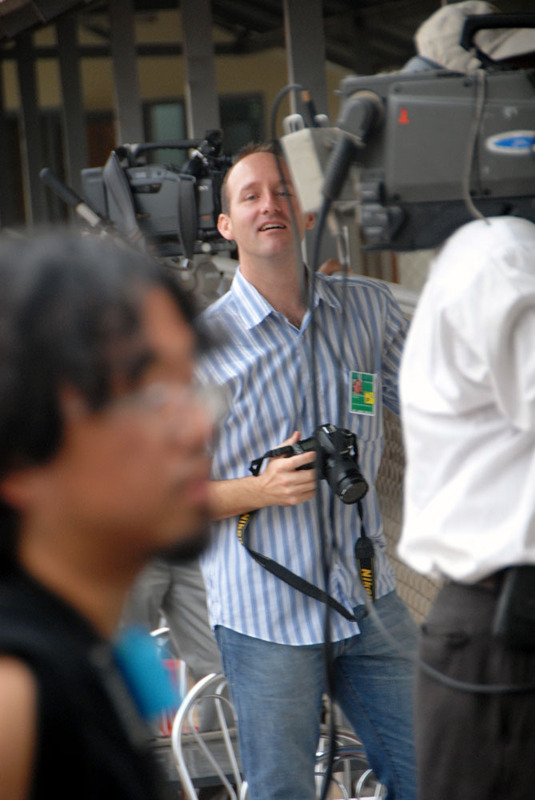 Jerry Harmer on camera. 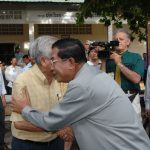 Cambodian Prime Minister Hun Sen shakes hands with old friend Benny Widyono during the 2008n election. 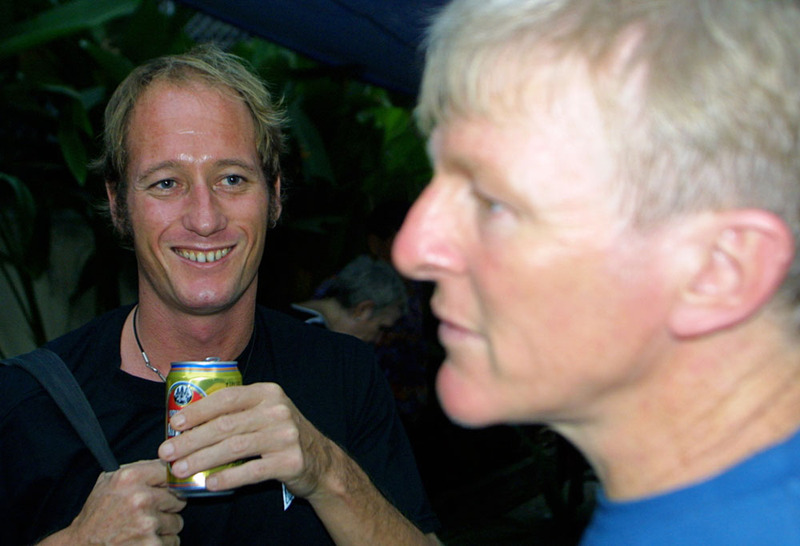 James Gerrand and Reach Sambath are in the background. 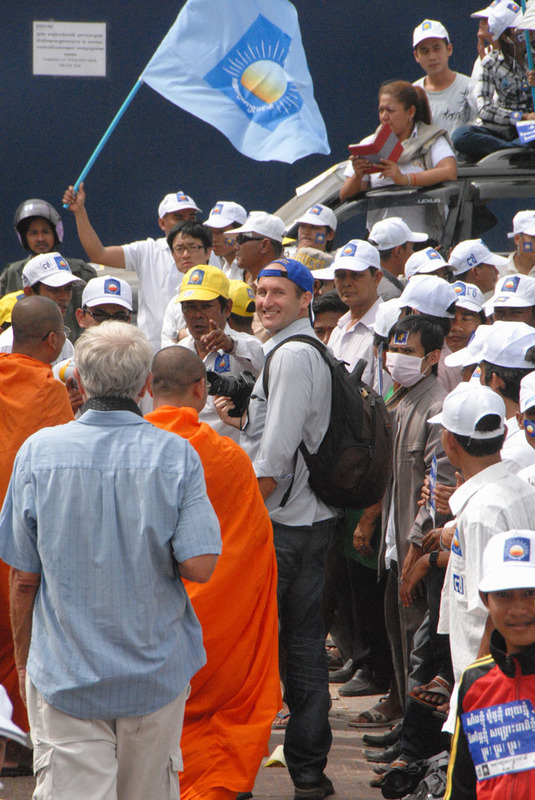 Film maker Paul Roy during campaigning for elections in 2008. 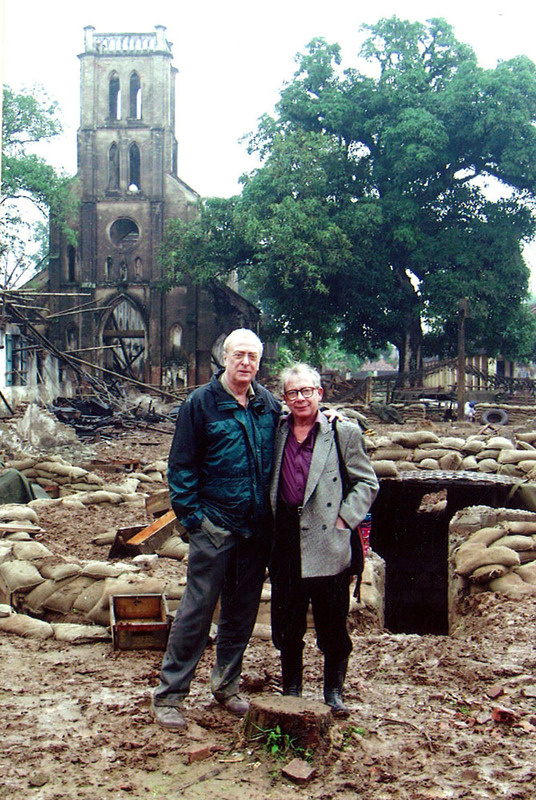 Cameraman James Gerrand and Paul Roy in the Dangrek Mountains where Pol Pot ran his insurgency for many years. 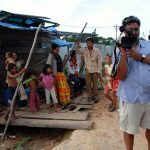 Journalist Ellie Ainge Roy in the Dangrek Mountains. 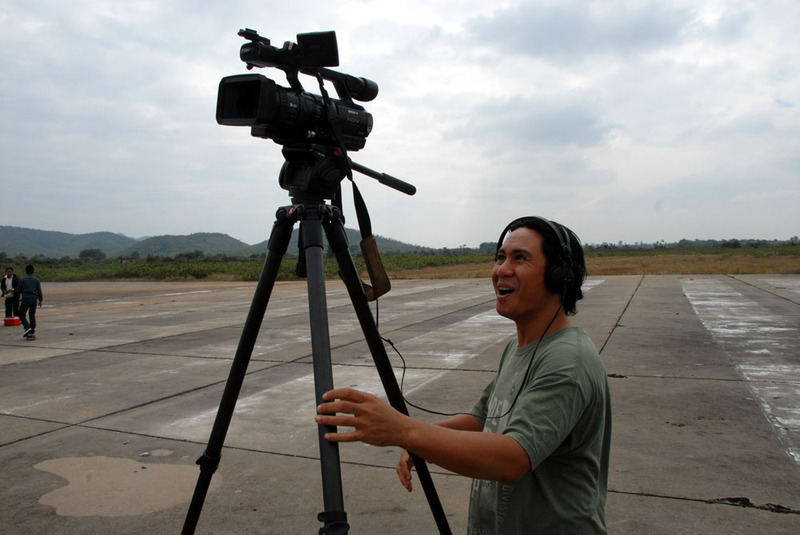 Film maker Paul Roy at work in northwest Cambodia. 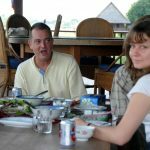 Film maker Paul Roy with daughter Ellie by the Mekong River. 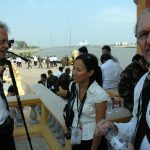 Journalist Peter Starr at hime by the Mekong River with journalist Ellie Ainge-Roy. 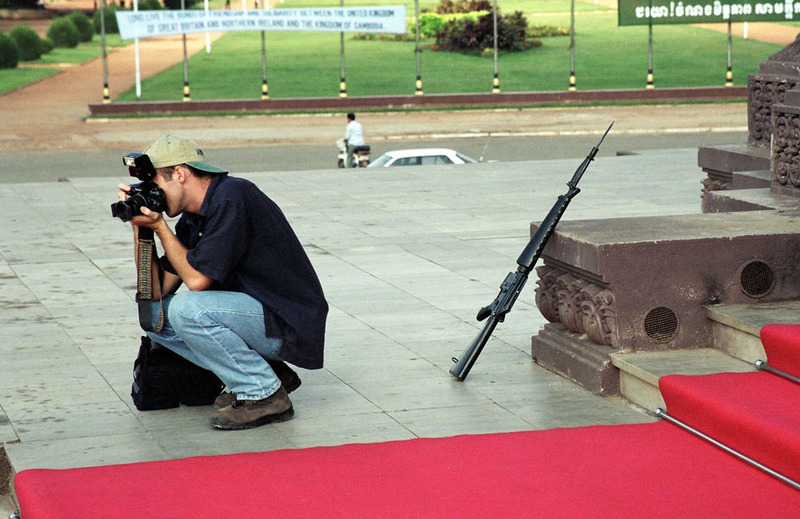 Shooting pictures. 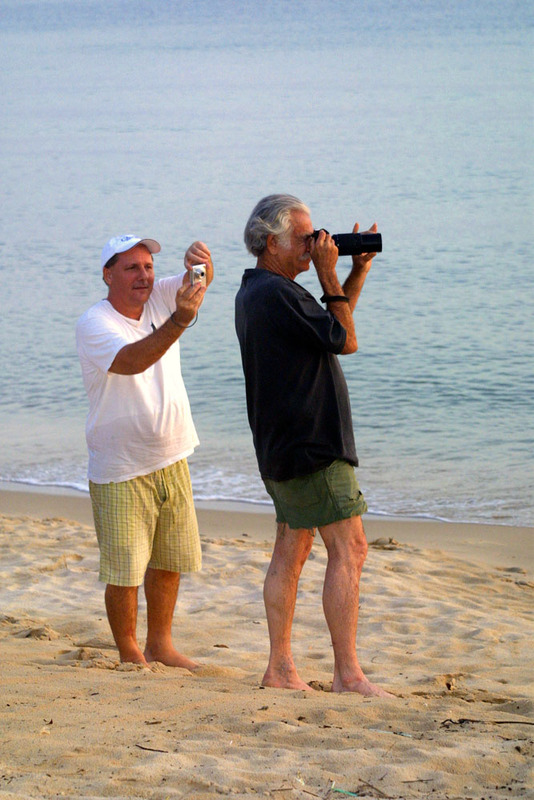 Hurley Scroggins and photographer Al Rockoff. 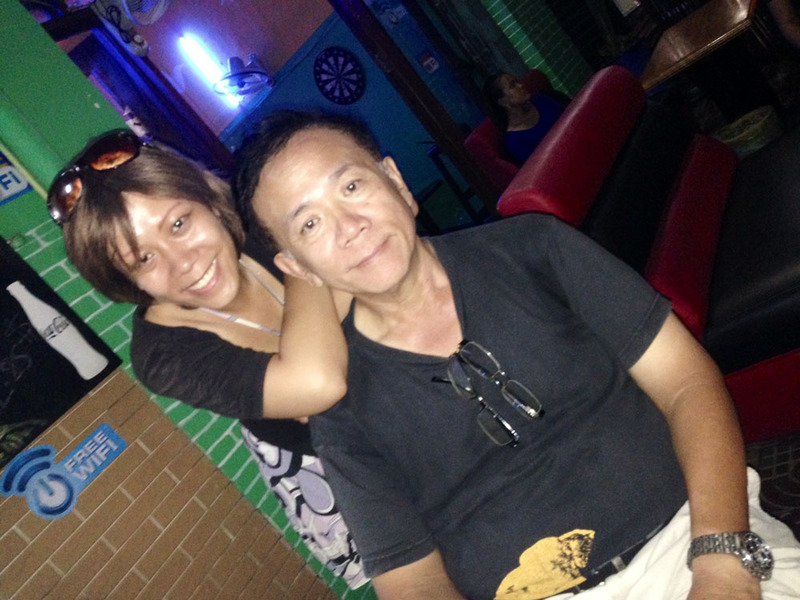 AFP house manage Kim Ly Song at Cantina on Sisowath in Phnom Penh. 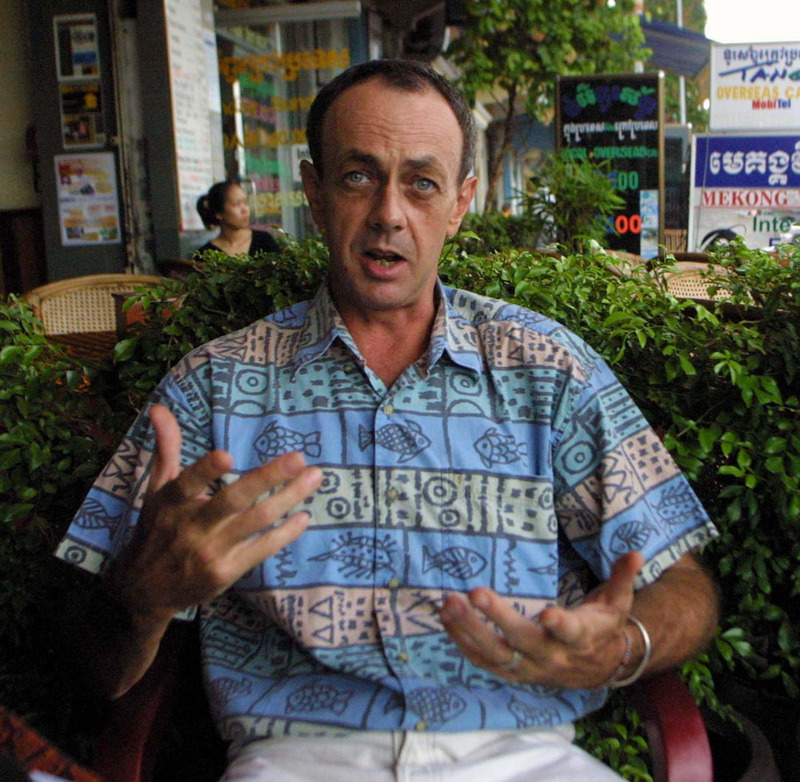 Former publisher of the Phnom Penh Post Michael Hayes. 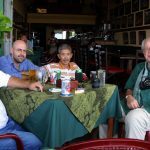 Khmer Rouge Tribunal investigator Craig Etcheson, OPCC member Seth Meixner, Kim Ly Song from AFP and famed photographer Philip Jones Griffiths at Cantina in Phnom Penh. 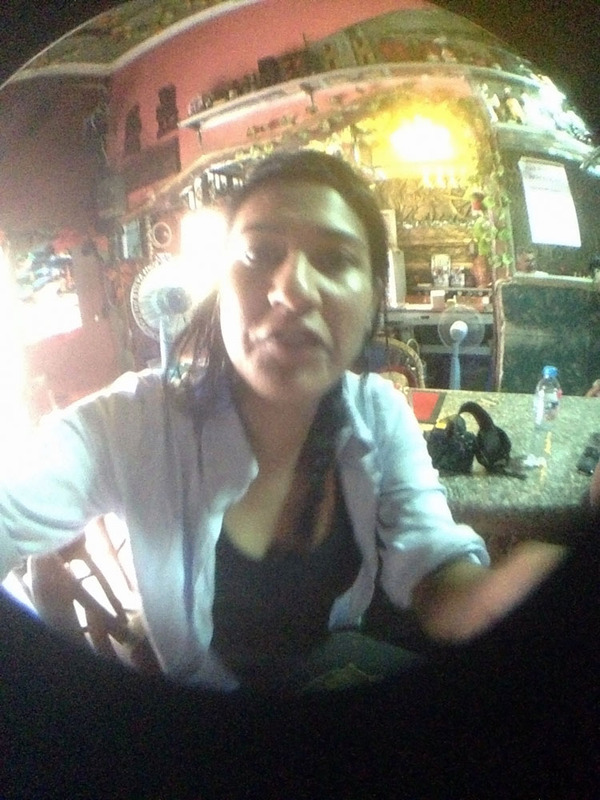 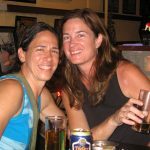 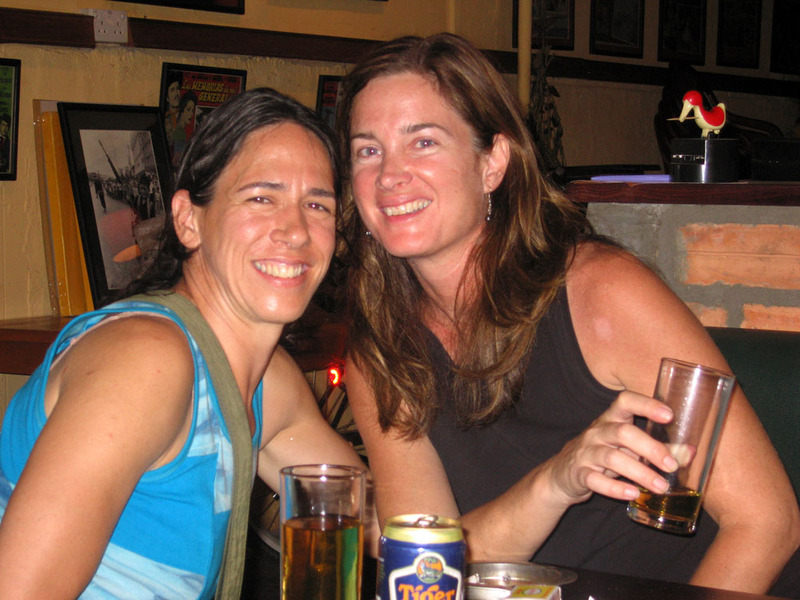 Film maker Lisa Millar at Cantina in Phnom Penh. 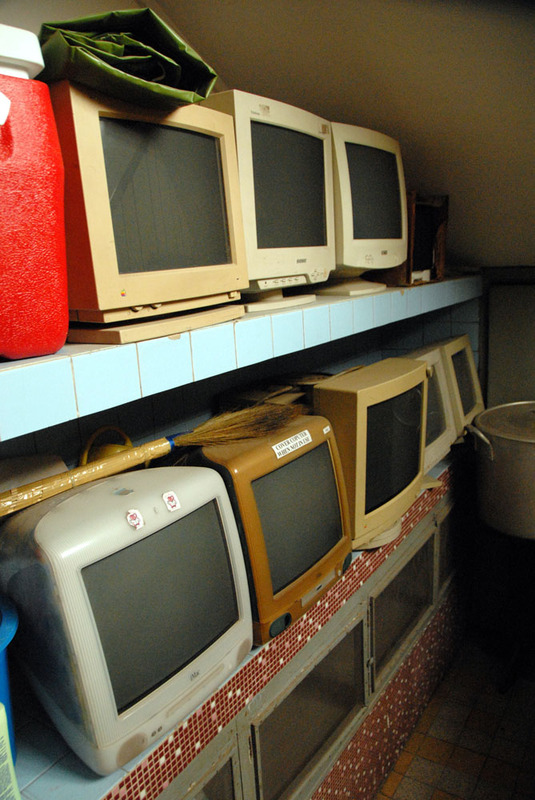 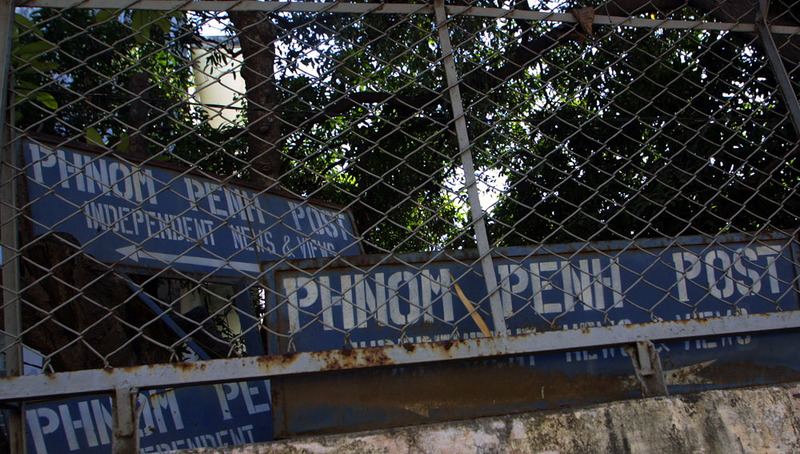 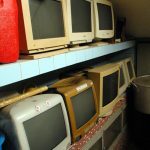 Old offices of the Phnom Penh Post. 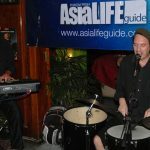 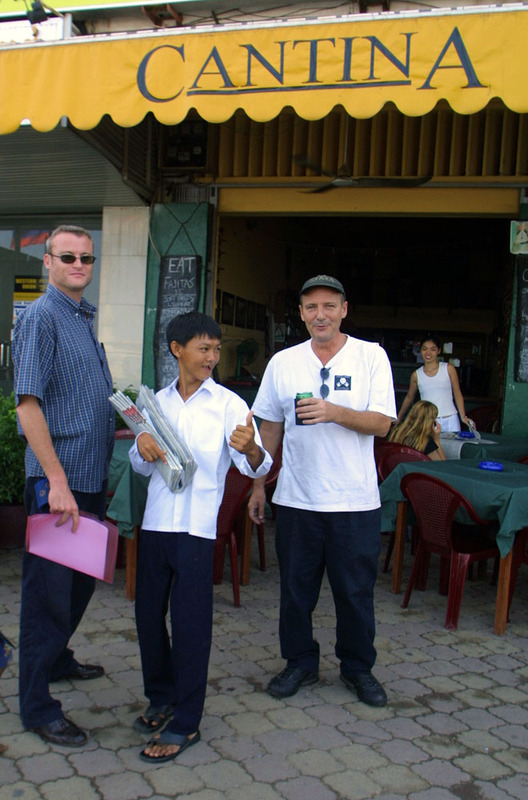 Adam John Clarke, Michael (then the local paper boy) Hurley Scroggins and Sharon Chan at Cantina in Phnom Penh. 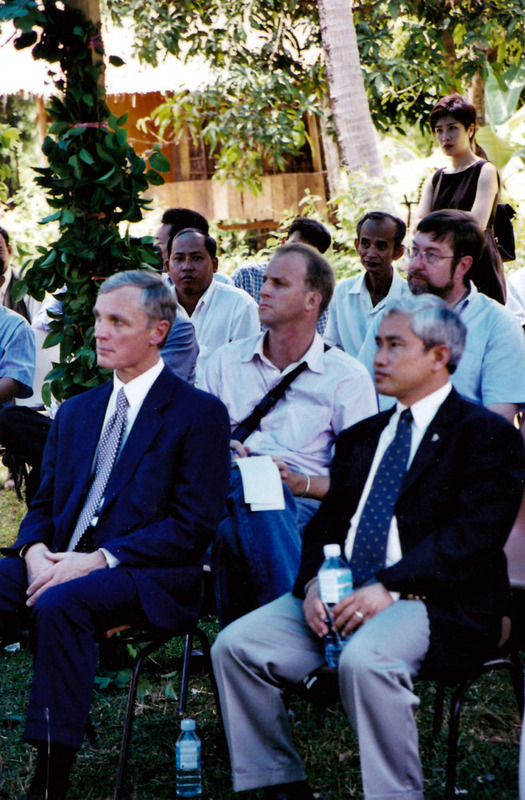 Rachel Louise Snyder (centre) and OPCC board member Robert Starkweather in 2003. 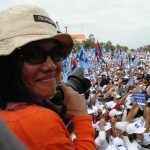 Wendy Lucas, co-founder of Talkn’ to a Stranger and later The Lost Room. 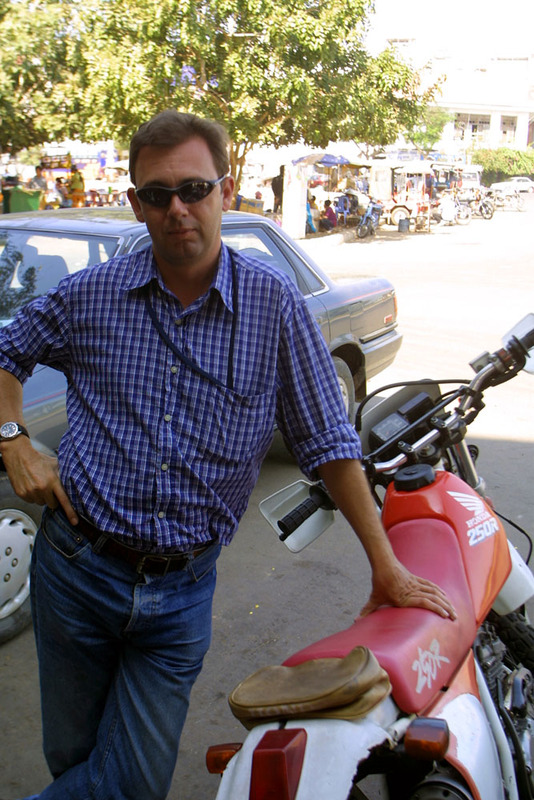 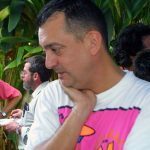 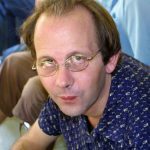 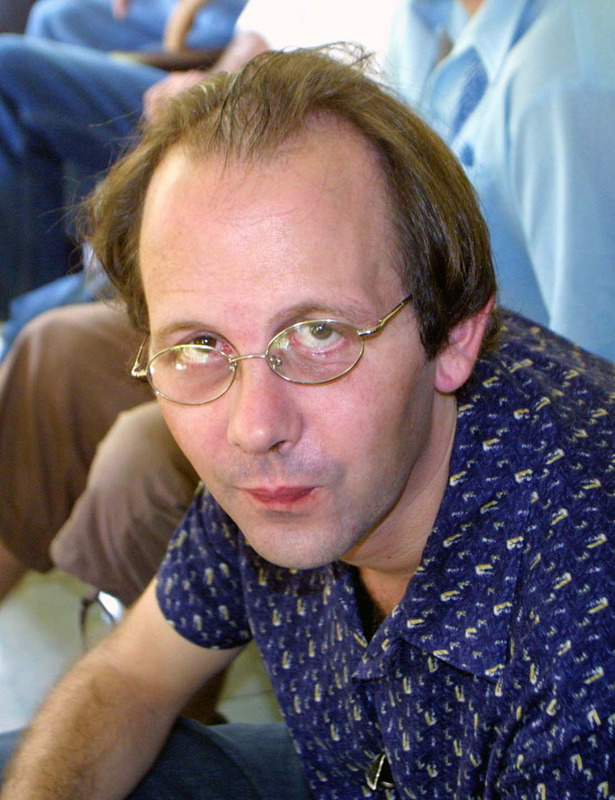 Photographer and travel writer Dan White, Christmas at the AFP house in Phnom penh, 2003. 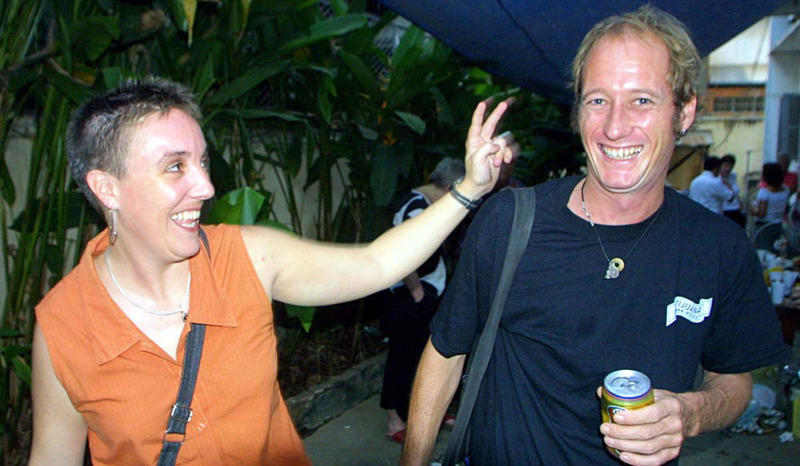 Former OPCC President Bronwen Sloan and the Australian rugby league writer Steve Mascord. 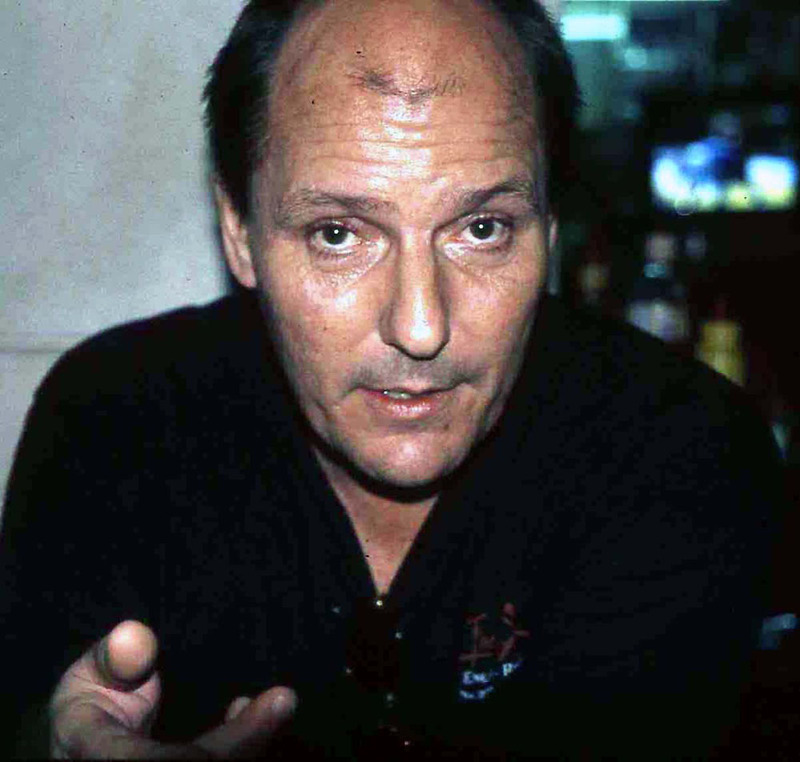 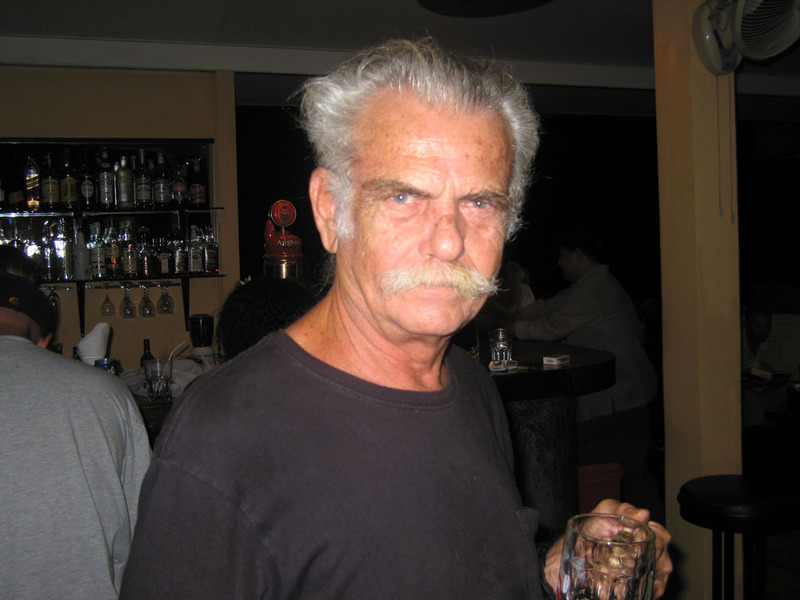 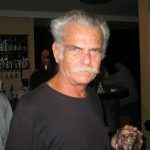 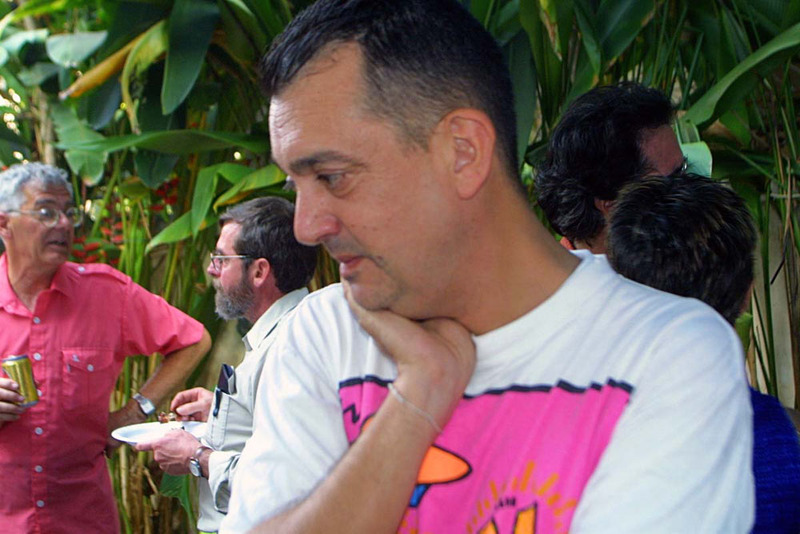 Ian “Snow” Woodford, former bar owner and popular character among journalists, 2001. 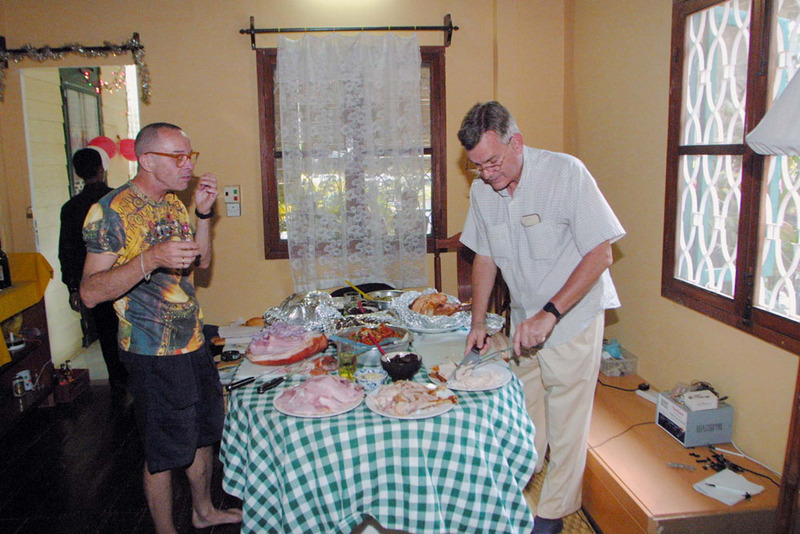 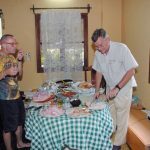 Australian Derek Mayes from Talkin To a Stranger Bar carves up the Christmas roast with Mikes Hayes, publisher of the Phnom Penh Post at Luke Hunt’s house in Phnom Penh, Cambodia. 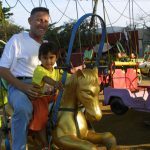 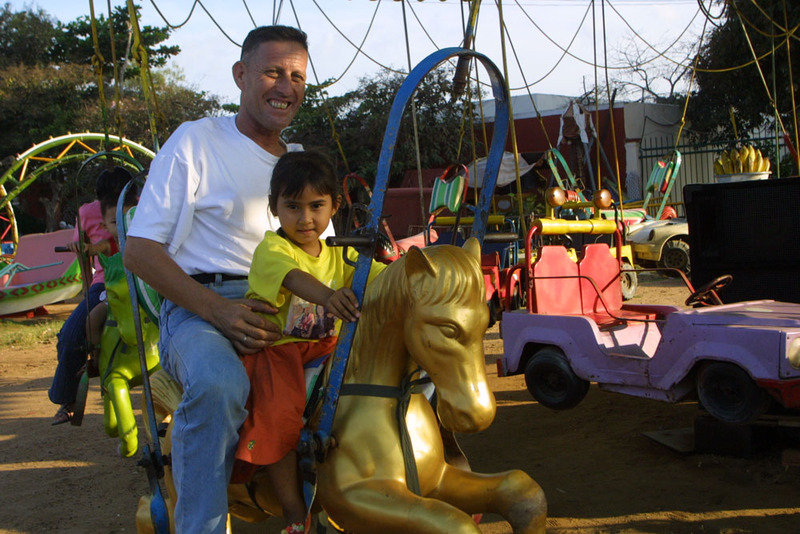 Long time Cambodian resident Ian “Snow” Woodford, from Australia, takes a ride with daughter Maxine in Phnom Penh. 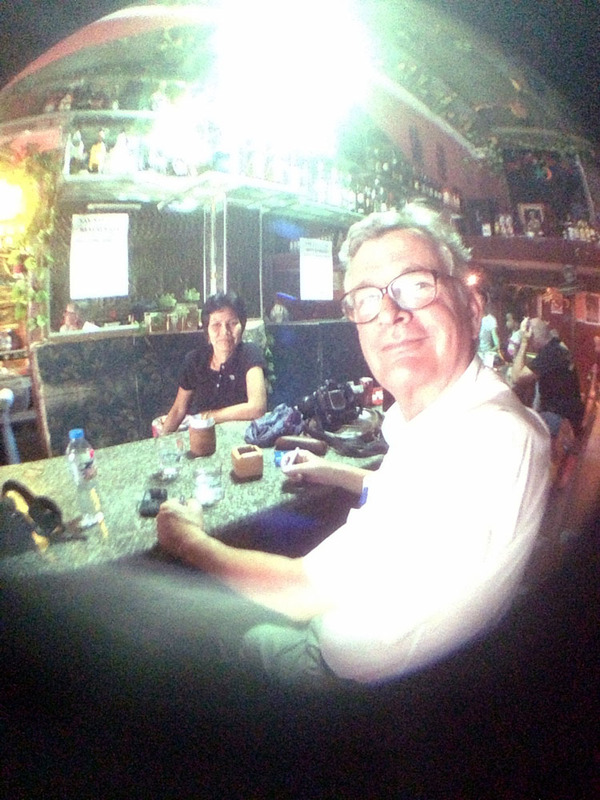 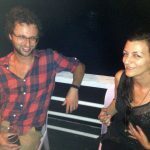 Managing editor of the Phnom Penh Post Mike Coran with doco maker Lisa Millar in Phnom Penh. 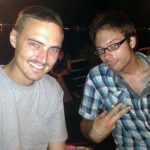 Both are from the US. 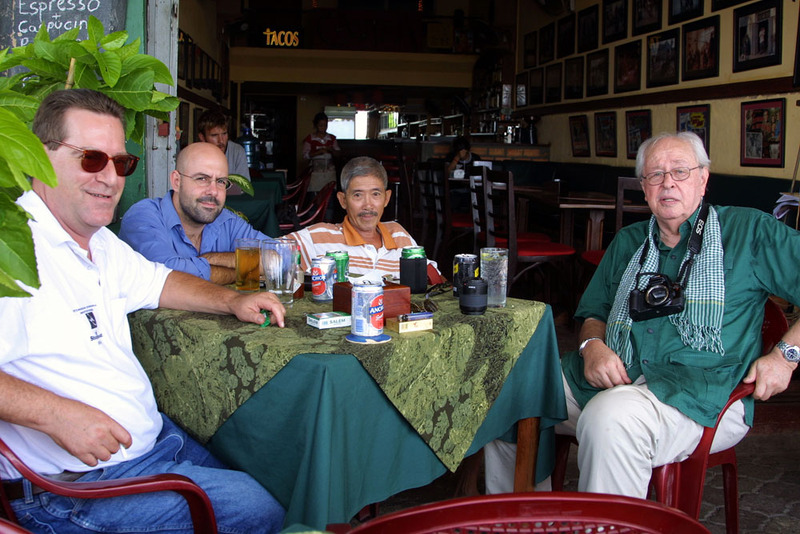 Former AFP journalist and author Peter Starr takes a monet out during a barbecue in Phnom penh, Cambodia. 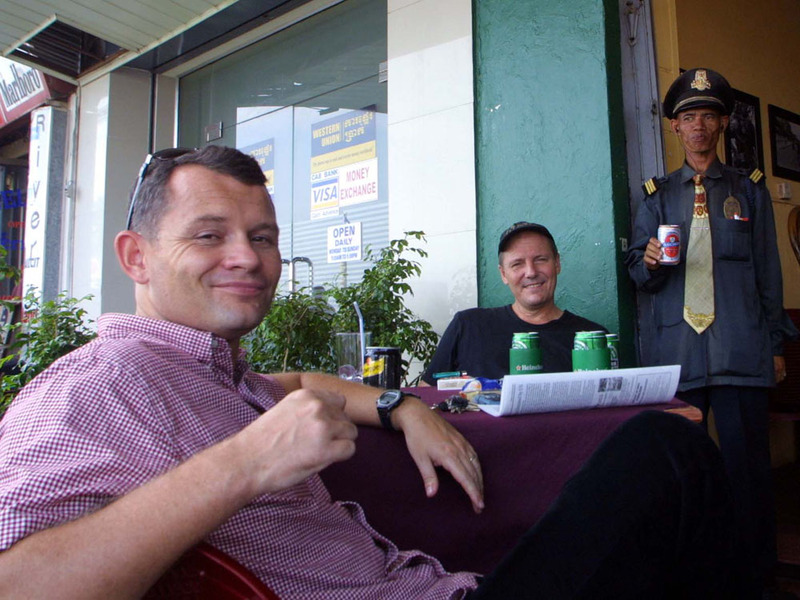 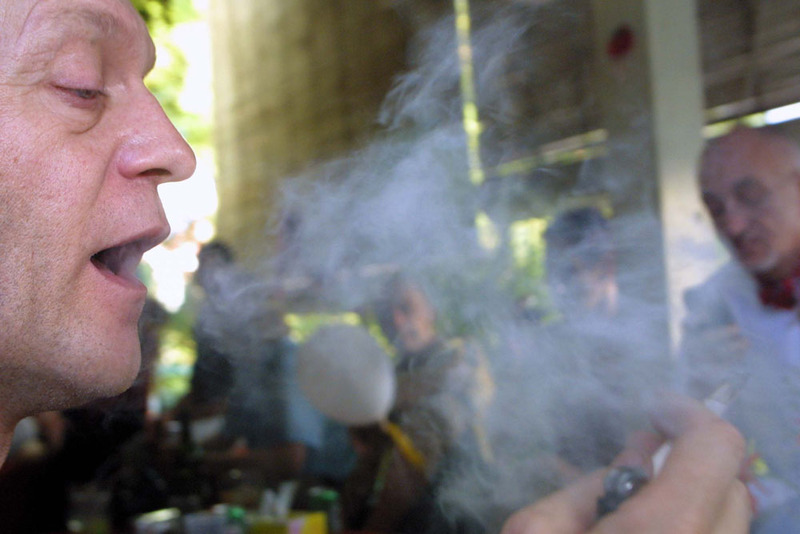 British photographer Martin Flitman takes a smoke on Christmas Day in Phnom Cambodia. 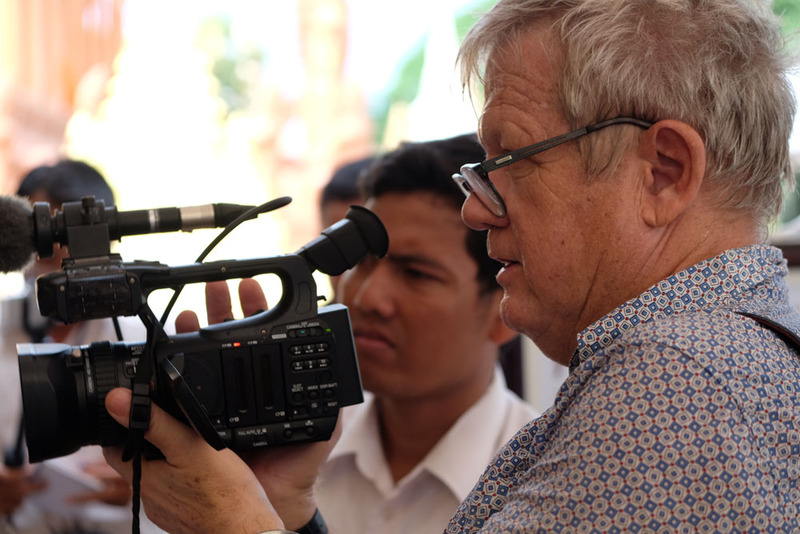 Australian cameraman and Emmy Award winning documentary maker on Sisowath by the Tonle Sap in Phnom Penh, Cambodia. 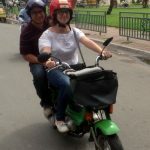 NGO worker Karen Rasmussan from the US horses around with boyfriend Nathan Dexter, an Australian photographer in Phnom Penh, Cambodia. 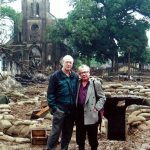 Australian photographer Nathan Dexter with New Zealand documentary maker Stanley Harper whose latest production is being produced by David Putnam. 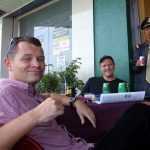 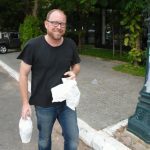 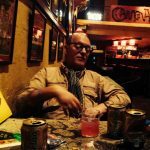 Irish journalist and managing editor of The Cambodian Daily holds court Bjorn Blengsli, a Norweigian anthropolgist in Phnom Penh, Cambodia. 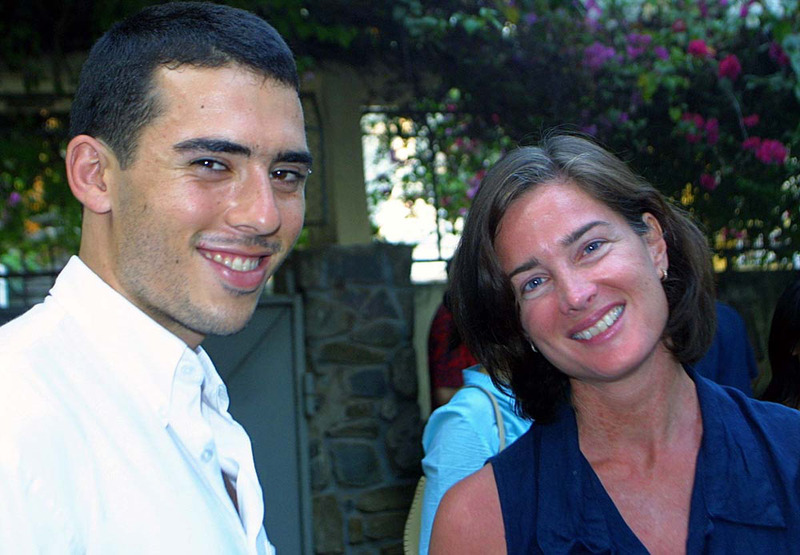 Former OPCC Robert Carmichael and gun, ahead of an inspection by Britain’s Princess Anne. 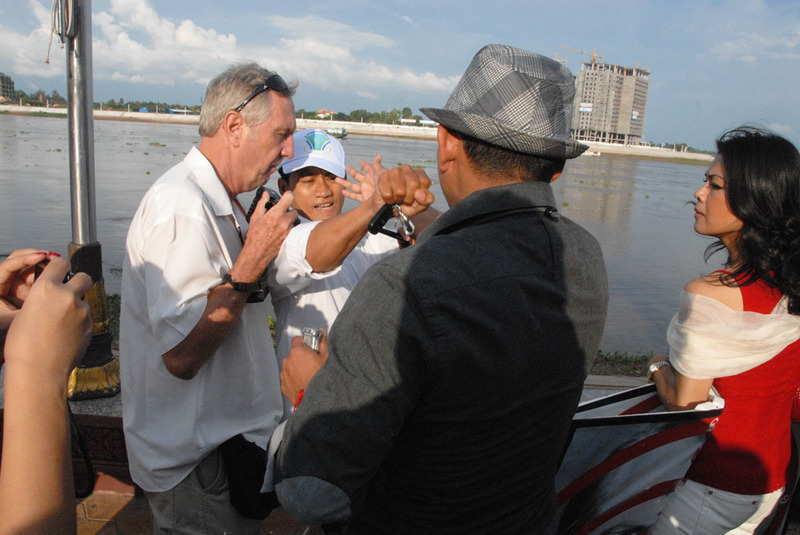 Ker Muntit of AP takes a pat on the back from former boss and owner of the Phnom Post, Michael Hayes, in Phnom Penh Cambodia. 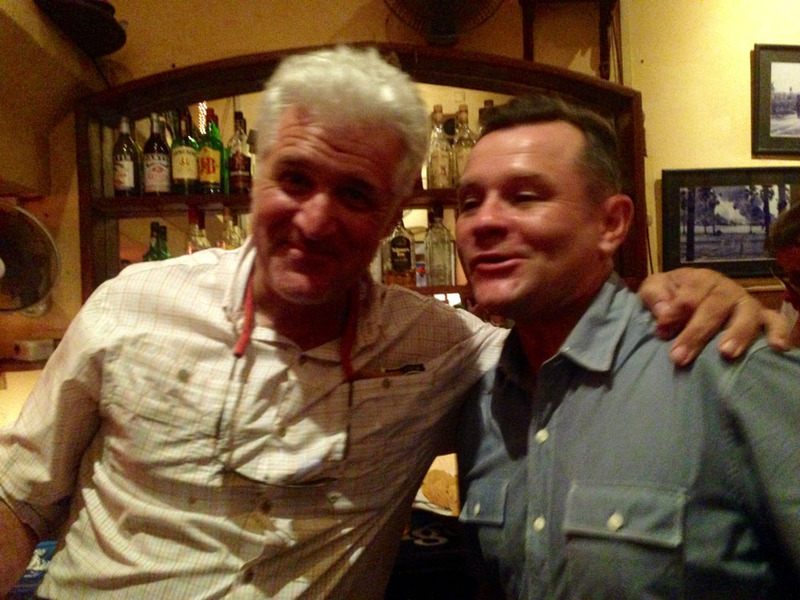 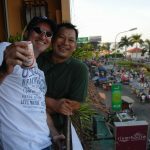 Managing editor of the Cambodian Dailey Kevin Doyle shapes up alongside The Captain who featured in Mat Dillon’s City of Ghosts and Hurley Scroggins at La Luna Cantina in Phnom Penh Cambodia. 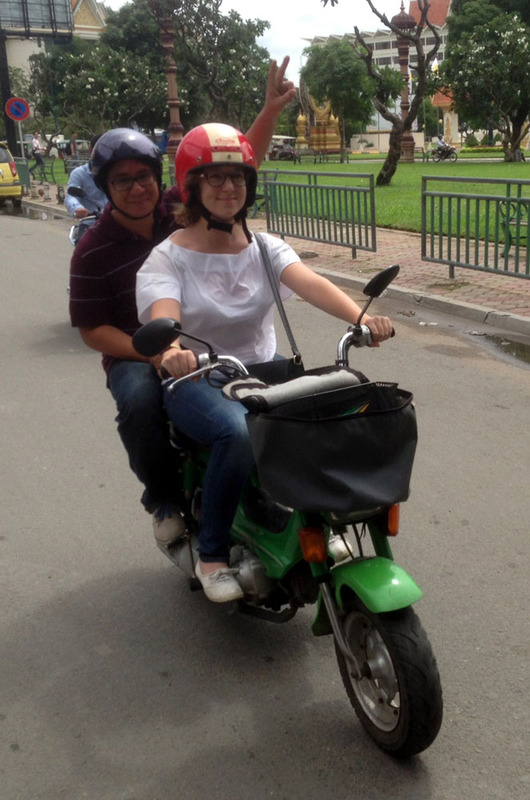 AFP journalists Reach Sambath and Suy Se in Phnom Penh, Cambodia. 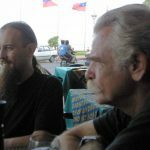 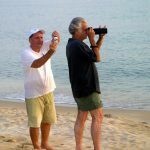 Australian photographer Murray Ray and alongside legendary photographer US Al Rockoff who was played by John Melkoavich in the film The Killing Fields. 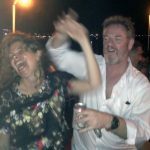 Al hated the movie. 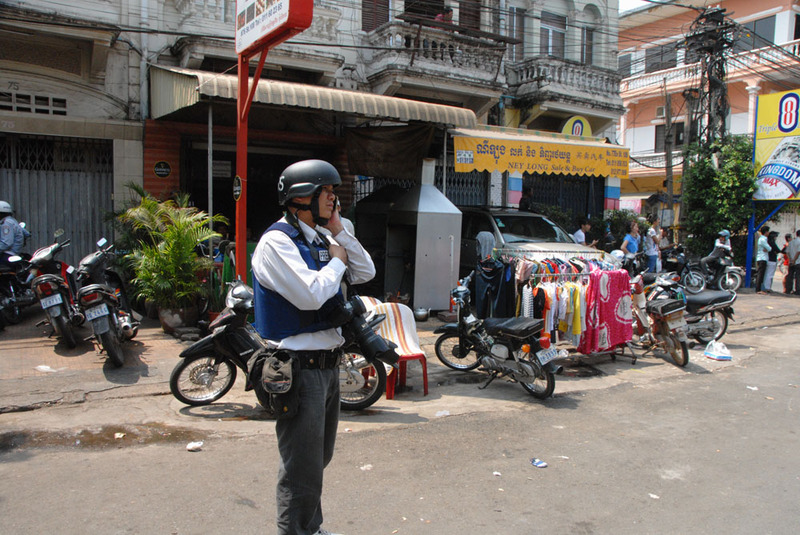 In Phnom Penh, Cambodia. 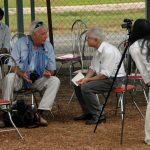 Journalist, photographer, author and former OPCC president Robert Carmichael. 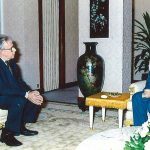 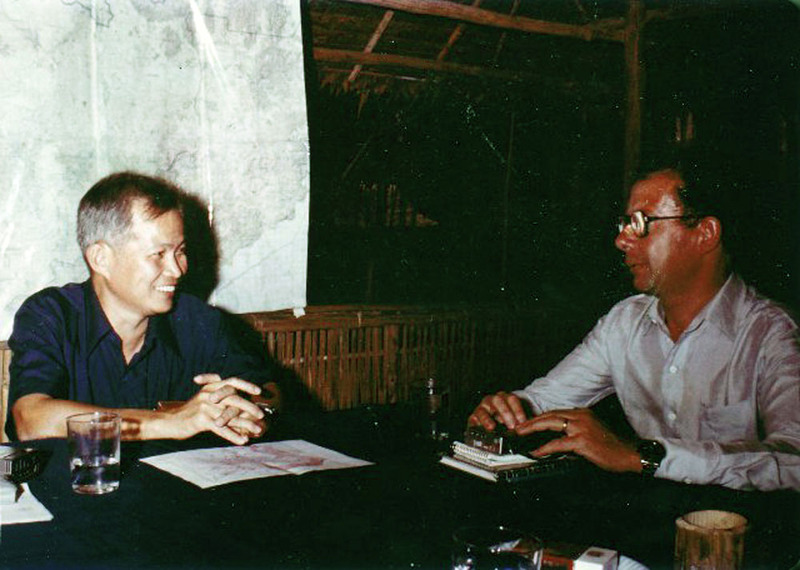 Former Khmer Rouge head Khieu Samphan is interviewed by OPCC life member Jim Pringle. 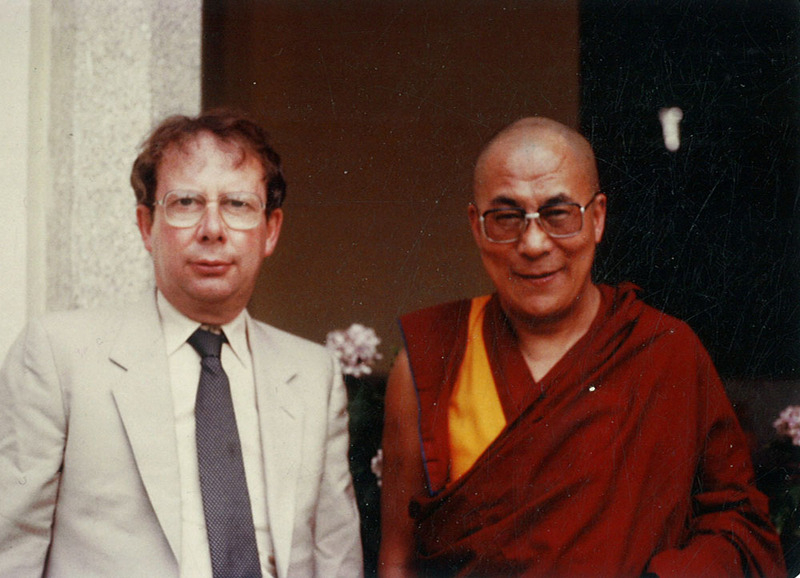 July 1980. 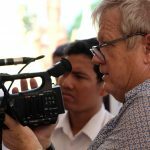 OPCC life member Jim Pringle interviews a young Cambodian Prime Minister Hun Sen.
OPCC life member Jim Pringle on the set of “A Quiet American” with actor Michael Caine. 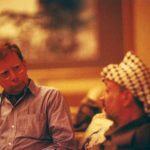 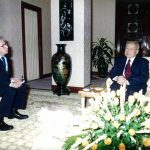 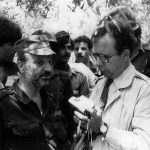 OPCC life member Jim Pringle interviews Palestinian leader Yasser Arafat. 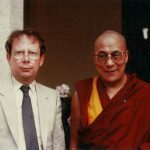 OPCC life member Jim Pringle with the Dalai Lama. 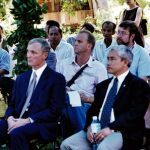 OPCC life member Jim Pringle with King Norodom Sihamoni. 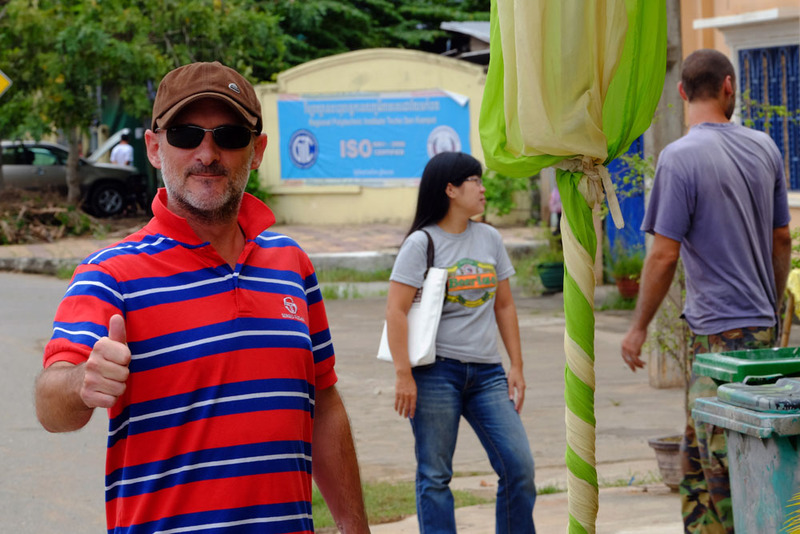 OPCC life member Jim Pringle at work in the Vietnam. 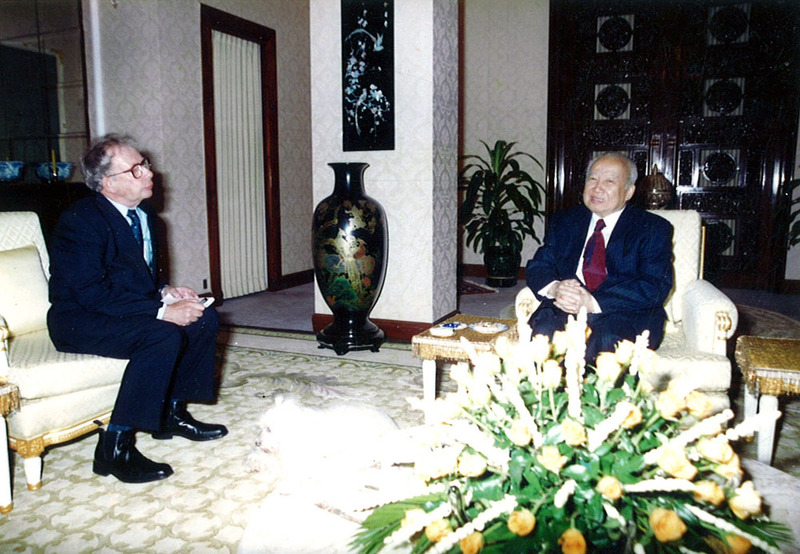 OPCC life member Jim Pringle with King Norodom Sihanouk. 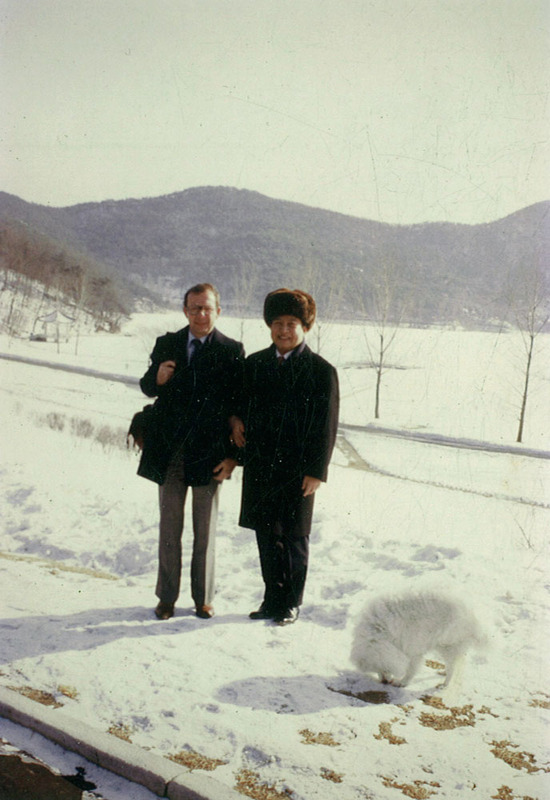 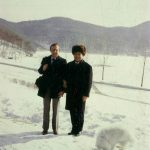 OPCC life member Jim Pringle with King Norodom Sihanouk in North Korea. 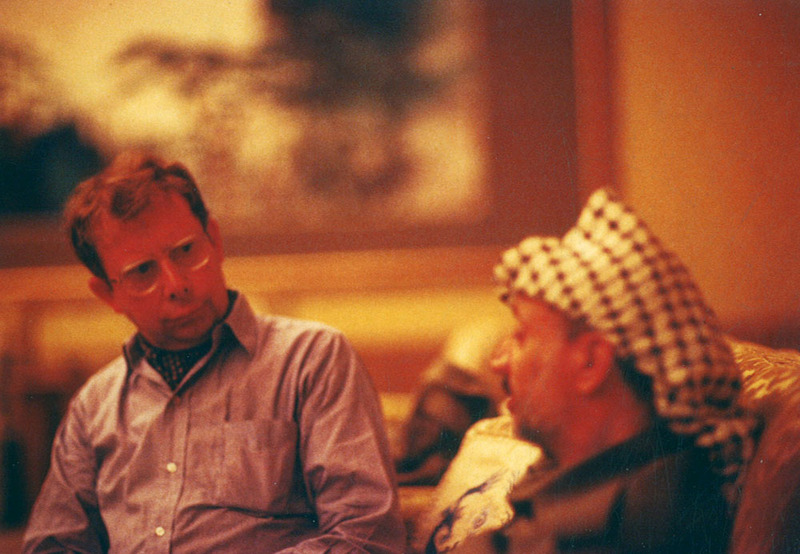 OPCC life member Jim Pringle with Palestinian leader Yasser Arafat.